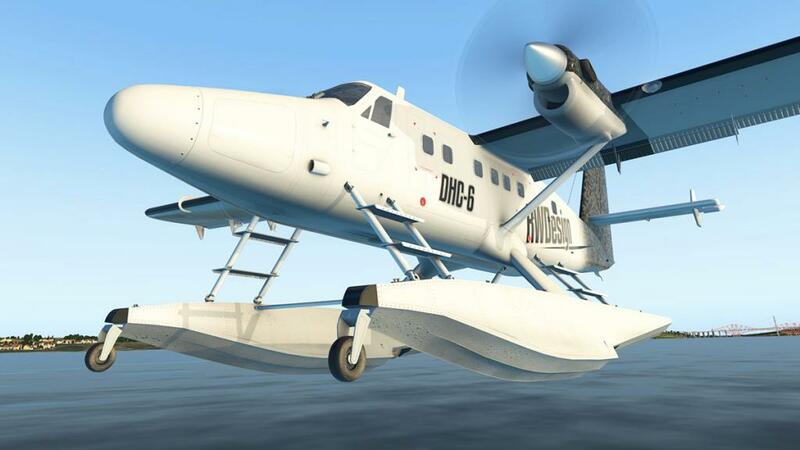 It is just under three years ago in Feb 2015 was when RW Designs first released their version of the DHC-6-300 or the Twin Otter. 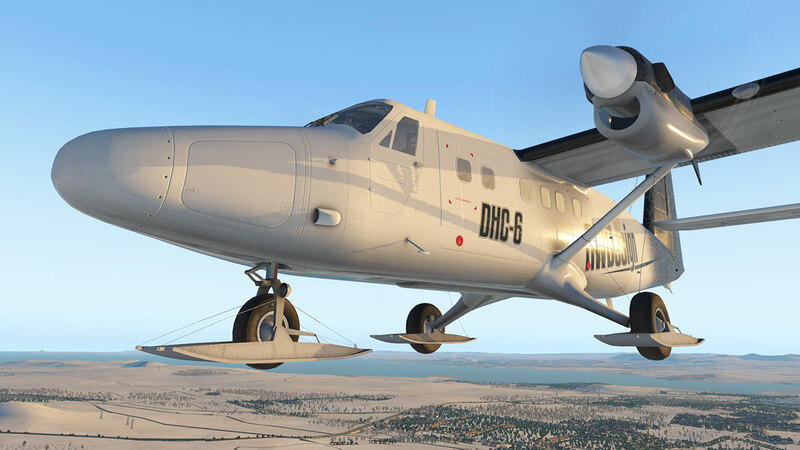 It was a competent design as we saw in the review : Aircraft Review : de Havilland Canada DHC-6 Twin Otter -300 Series by RW Designs. 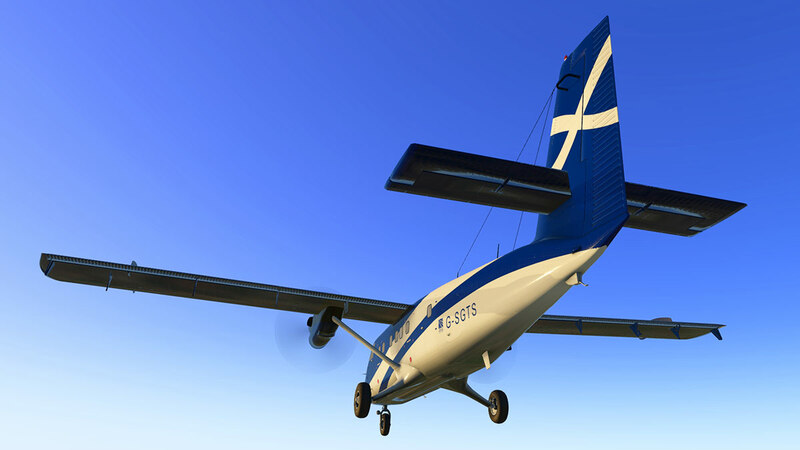 The aircraft did however have some traits that divided the purchasers into the "very much like" and the "missing something" divisions, I personally didn't mind it as it was at least a decent Twin Otter to fly. 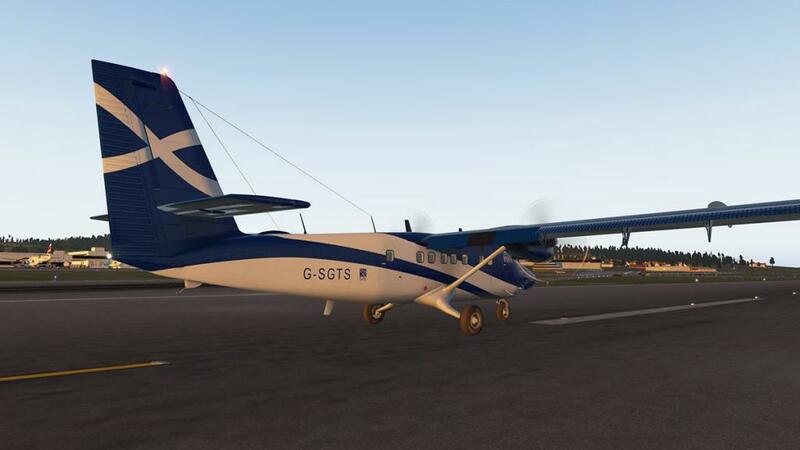 And here now is v2 or the X-Plane11 version of the aircraft and at first glance it looks like the the next update for X-Plane11 for the aircraft. 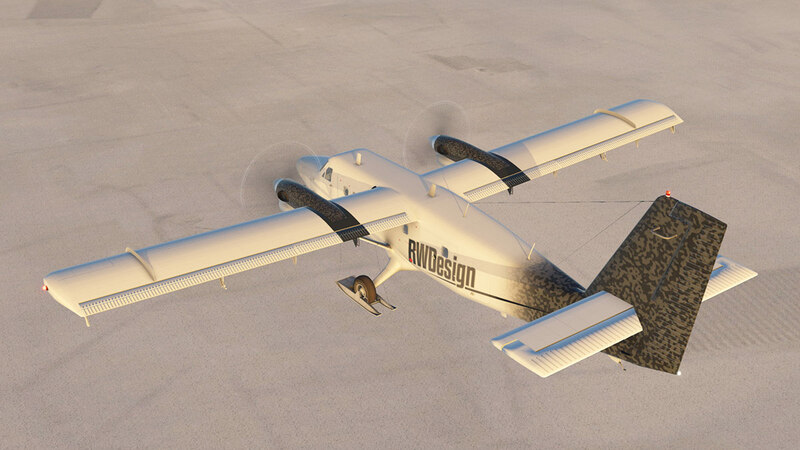 But to think that and you would be wrong, and in fact completely wrong as this Twin Otter is a completely new design from the ground up, and only a few elements have been passed over from the original design. 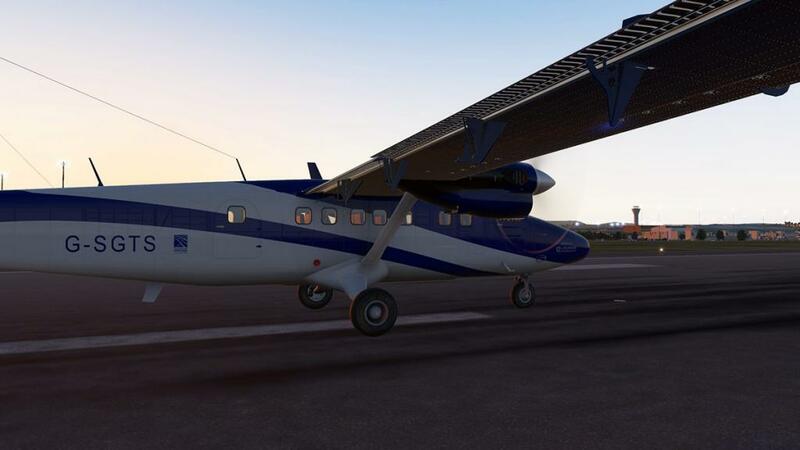 Everything has been completely remodeled, from the actual aircraft, its systems and its features and it is also X-Plane11 tuned and uses X-Plane11 features in its design. 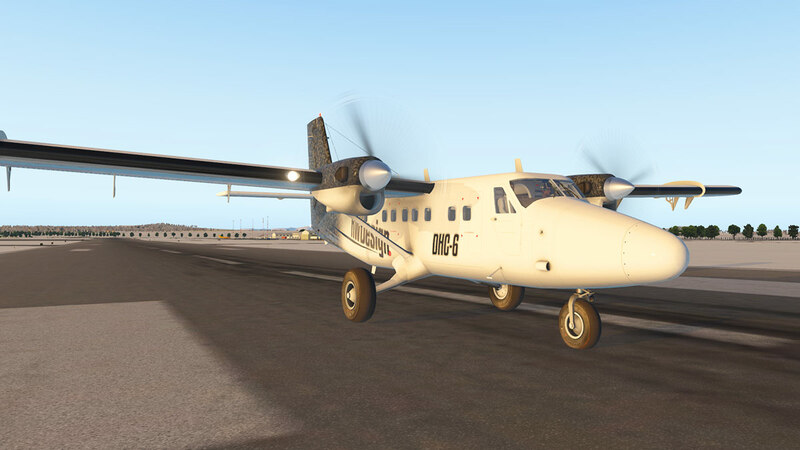 So this DHC-6-300 is a full upgrade, not an update. 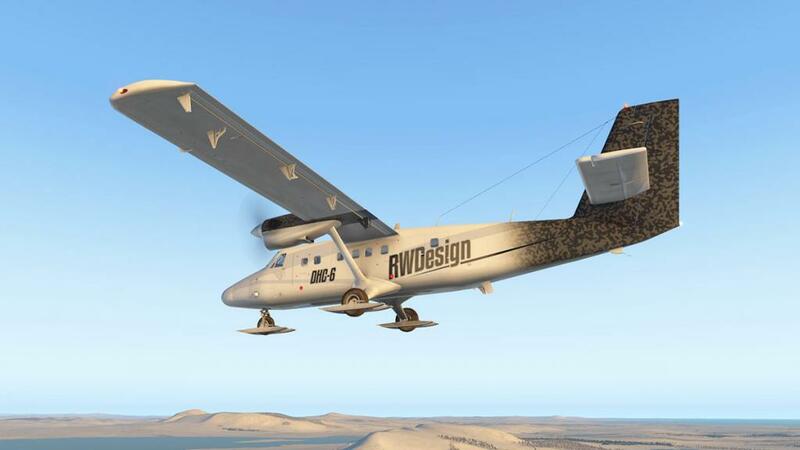 And what you are purchasing here is a completely new aircraft, but there is also a discount for users to update from the original version to this all new v2 aircraft that allows access without the full cost of the purchase price. 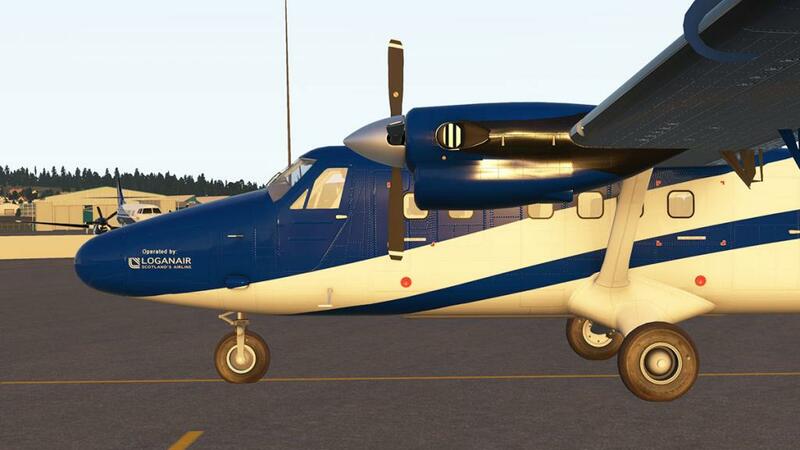 The overall external design of the original was very good with great detailing of rivets and paneling from the X-Plane "draw per pixel lighting" shading effects and the aircraft body fittings, but there was also a few clunky areas of like the thick rear doors and the average cabin, but overall in the right lighting conditions the original DHC-6 did look very nice. 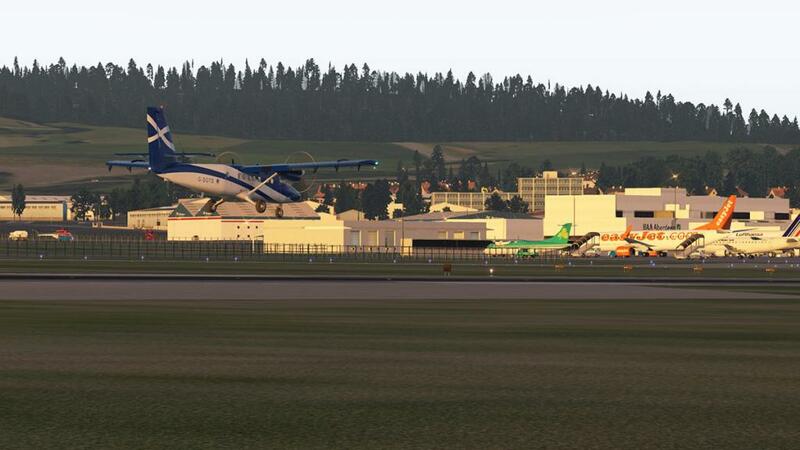 But that was three years ago, and an eon of ages in X-Plane terms and with all the changes to X-Plane11. It was a smart decision to not to try to and simply adjust the design to this new era, but to create a completely new version directly for the changes. Yes that does create a lot of work, extra work, but it also puts you in a far better position because you will have raised the quality standard at the same time and also the intimate quality of your own work. Yes starting afresh allows you do it better and with a better design and a far better approach than just trying to fix up those poor kinks that would be hard to fix anyway. So looking closely at the v2 aircraft the distinct quality is certainly far better, and the aircraft more far more detailed. 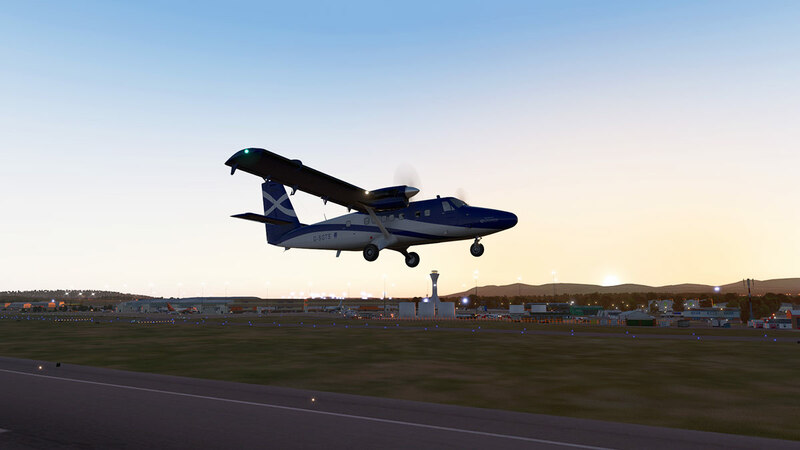 Certainly the X-Plane11 PBR features help any developer, but to use them effectively still takes skill, and you see that here on the excellent external area and flying surfaces, and also where it counts and this new aircraft can look spectacular in the right lighting conditions. ... and the new v2 design. The quality and detailing is quite significantly modeled far better with the specular lighting effects bringing out the quality. Baggage areas (front and rear) are now lined, but we have lost the bags in transit? 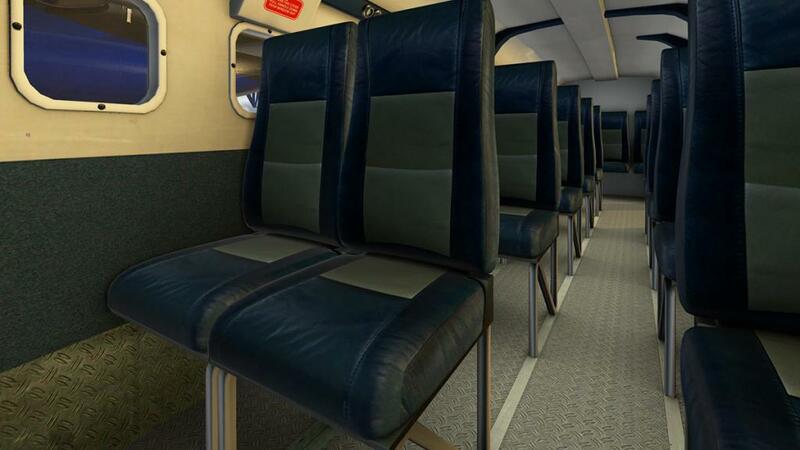 The cabin window detailing is now excellent and they are a huge difference from the original bulky frame idea. 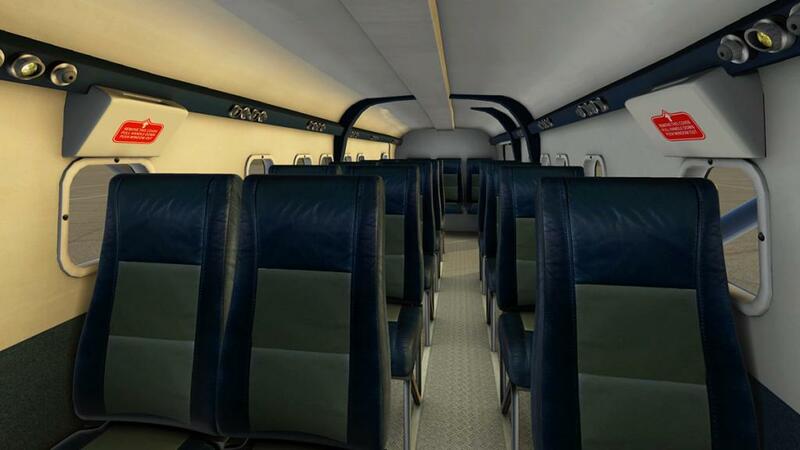 And were as the cabin in the original felt like an after thought, the v2 cabin is now excellent. For the insanely beautiful steel floor and the exquisite leather seats. Now this Twin Otter feels like a complete aircraft. 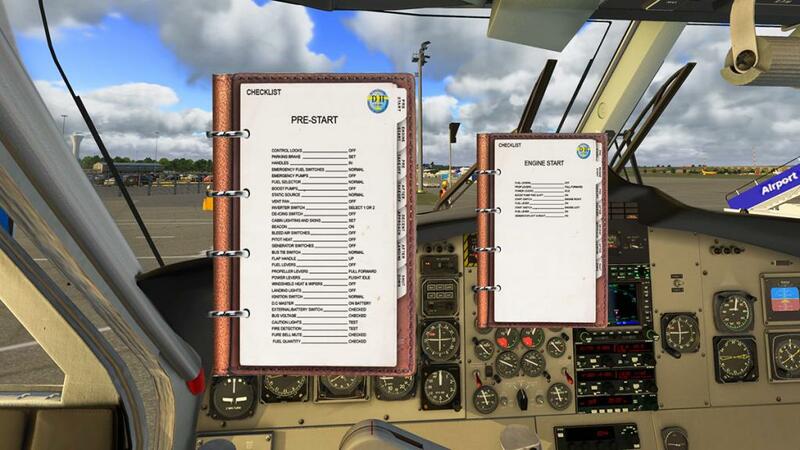 The aircraft also now has menus... 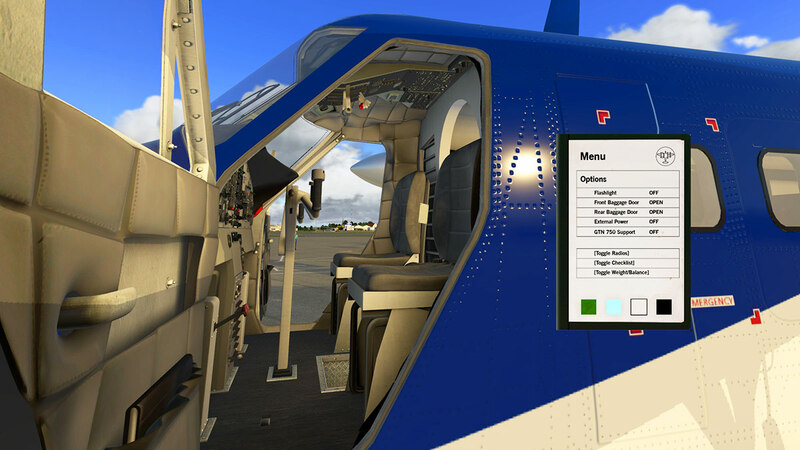 The menus are located in a flight book down in the pilot's door pocket. 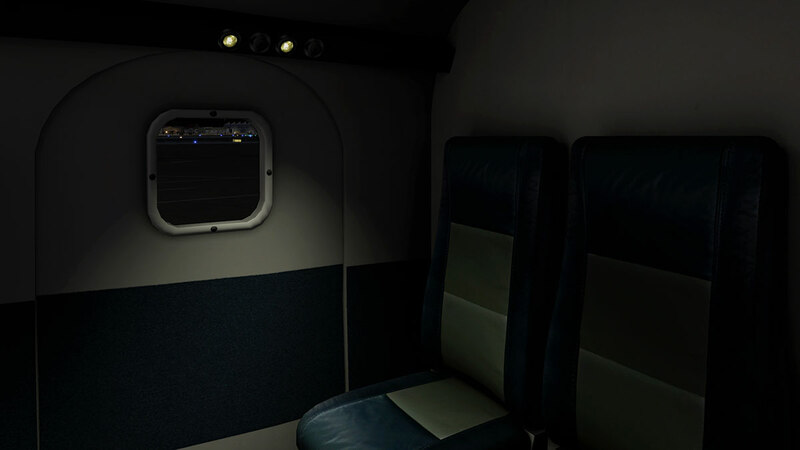 The main contents include a flashlight (X-Plane native) opening the front and rear baggage doors, external power supply and GTN 750 Support... but no menu options to open the main cockpit and cabin doors, of with which with the rear doors being hard to move to every time you want to open/close them is a bit of a side head scratching moment. 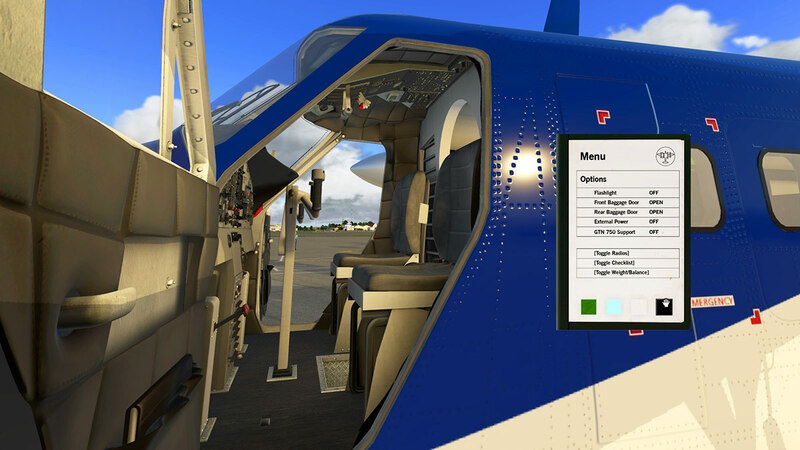 Lower menu is four cockpit colour options... In Green, Blue, White and Black. Green is green, but the Blue feels like very light Grey, White feels Grey and Black feels light brown. 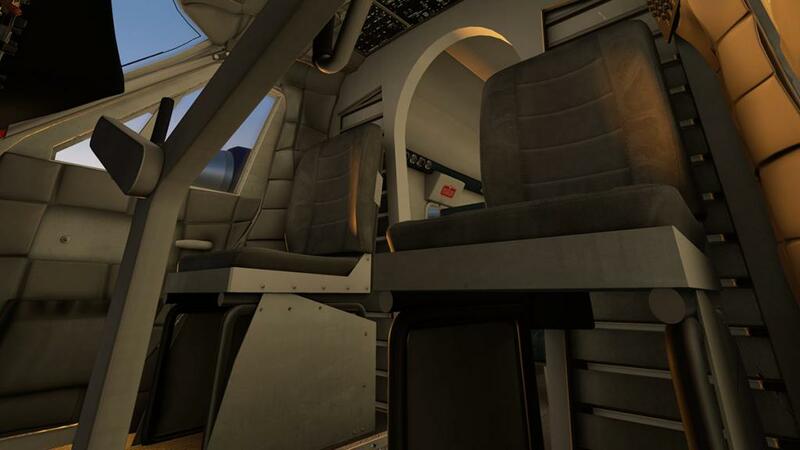 Only the cockpit colours change and not the cabin textures including the seats, which would have been a nice touch. The Checklist is excellent and covers all aspects of operation from start up to shut down, and the binder is moveable and scalable for ease of use. There is a very good "Weights&Balances" menu as well. You can set the fuel in kg's and the weights of baggage and passengers (Payload). Your aim is to keep the CoG (Centre of Gravity) around 30% of MAC. The full Empty Weight and Total Weights are all shown. There are both the "Long" and "Short" nose versions available. They are switched via the liveries with "LN" denoting the Long Nose and "SN" denoting the Short Nose. Besides the Standard wheel version there are three other variants in Float, Ski and Tundra tyres. 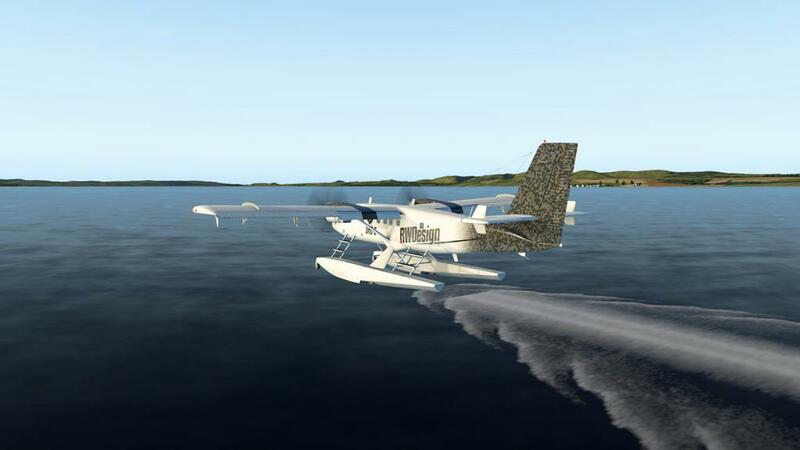 ... the aircraft handles nicely on the water (without a high swell) and with the opening rear doors, they both open out and not down for exit and entrance. The ski's are fastened on tight, as some developers make them raise or lower below the wheels. Overall the quality is very good. 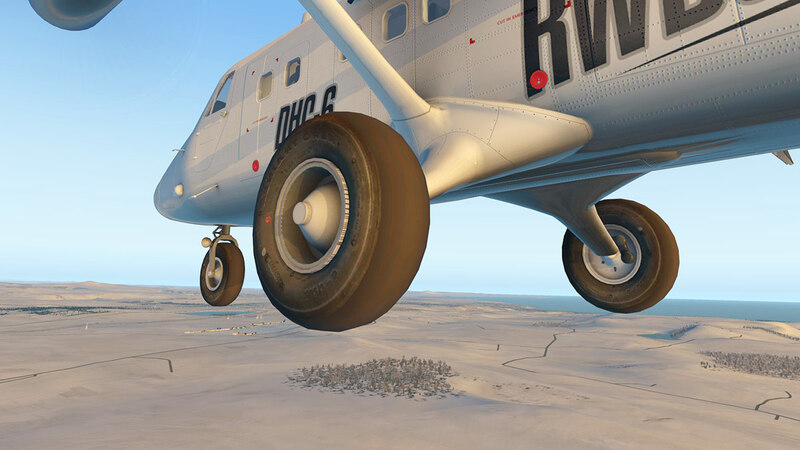 The huge balloon Tundra tyres are very well done here, and you don't get that bouncy floaty movement on landing but a nice grounded feel. 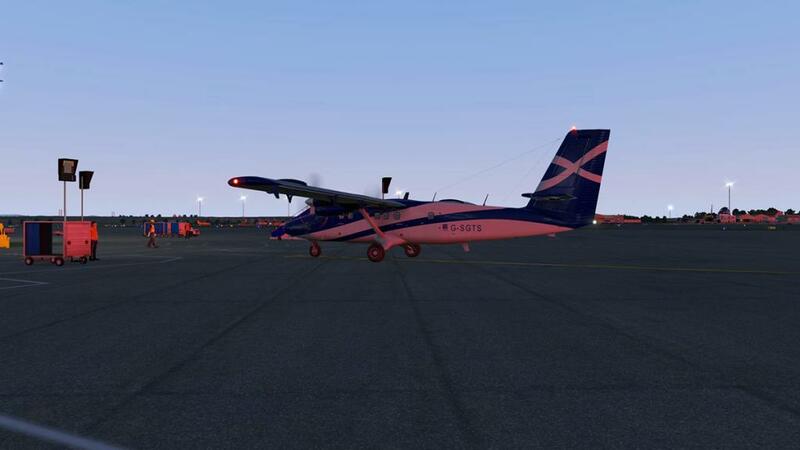 The early morning service today is the from EGPH (Edinburgh) to EGPD (Aberdeen) a simple hop of 93nm. 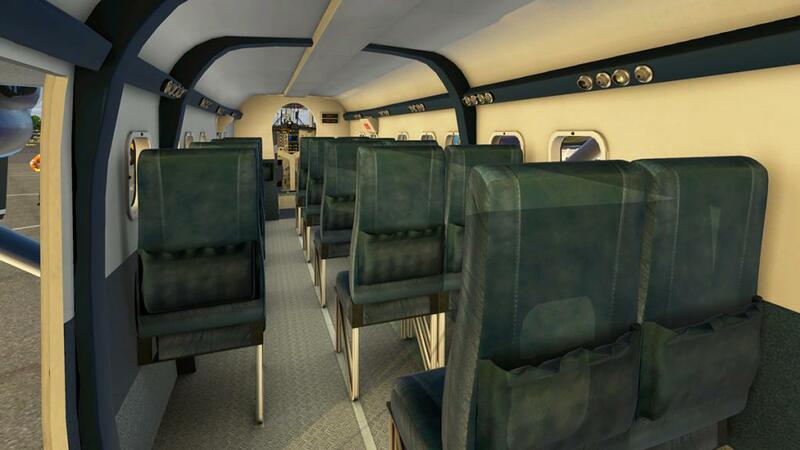 Aircraft was set up with 611kg of fuel and 1380kg of payload (passengers and baggage), for a gross weight of 6147kg. 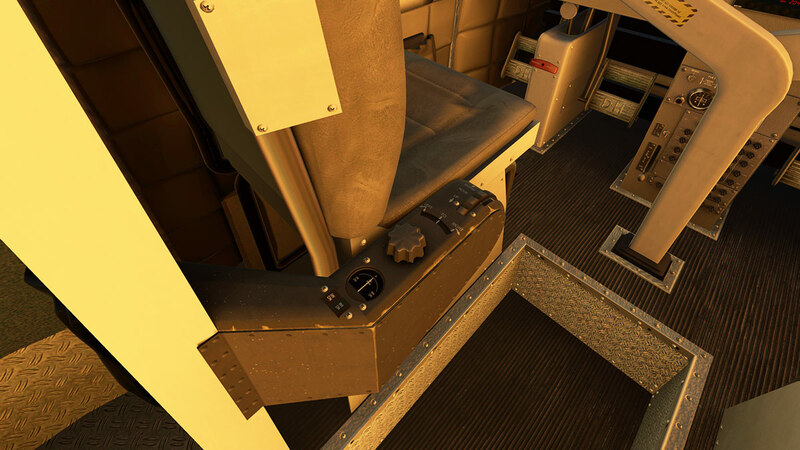 You need a bit of thrust to get the aircraft mobile, but once moving you can mostly keep it back in the idle position, and contain any speed with the brakes. 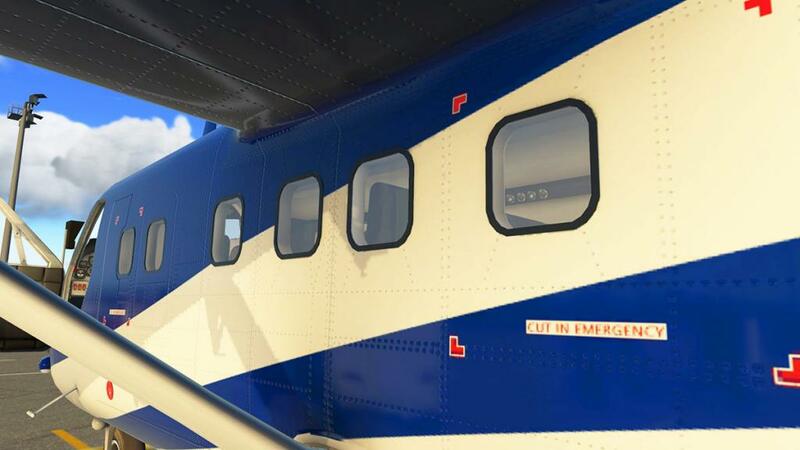 Flaps are set at 10º and the indicator is on the centre windscreen bar. 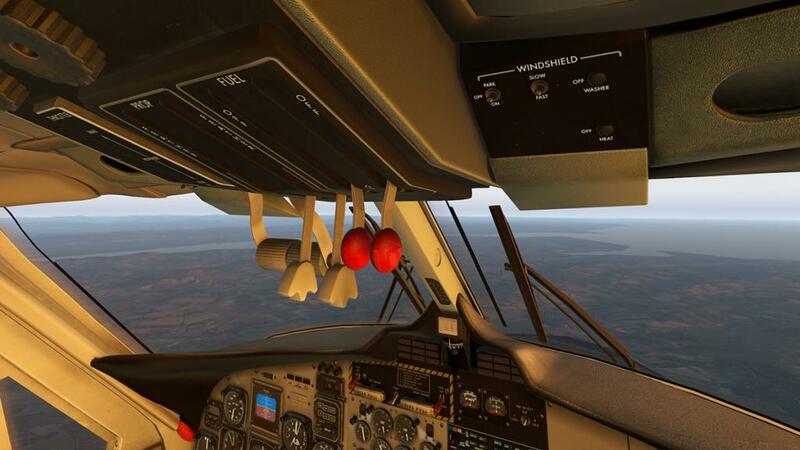 A final check and it is power up or power forward with the twin overhead drop down levers. .... 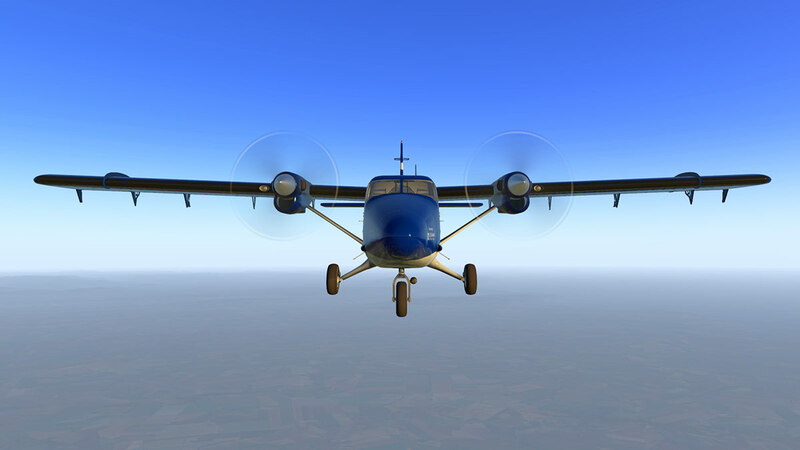 The differences with the X-Plane11 performance is quite considerable. 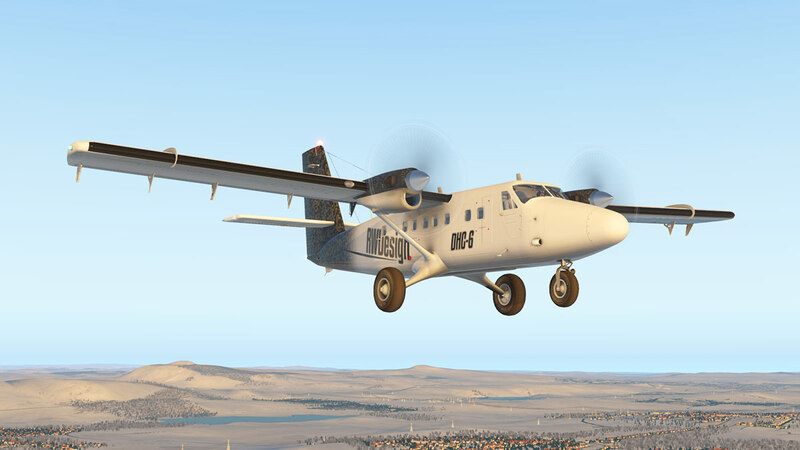 The original was not in performance as close as it should have been, certainly in the handling as this Twin Otter feels far much better as of the simulator changes. 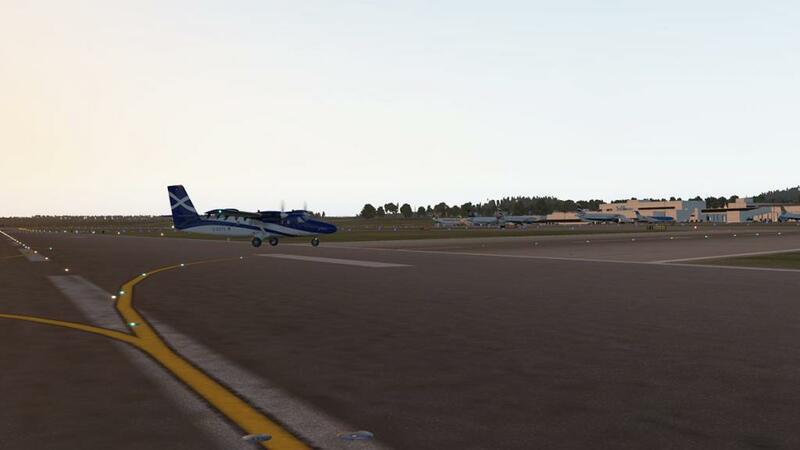 As with a lot of moving over to XP11 style flying, you need a short time to adjust to different feel and reaction, so any first flights won't give you the feeling you would expect from the aircraft straight away, but it does come in time and then and only you start to really love what you then have to fly, and after a few flights you will really understand what I mean. 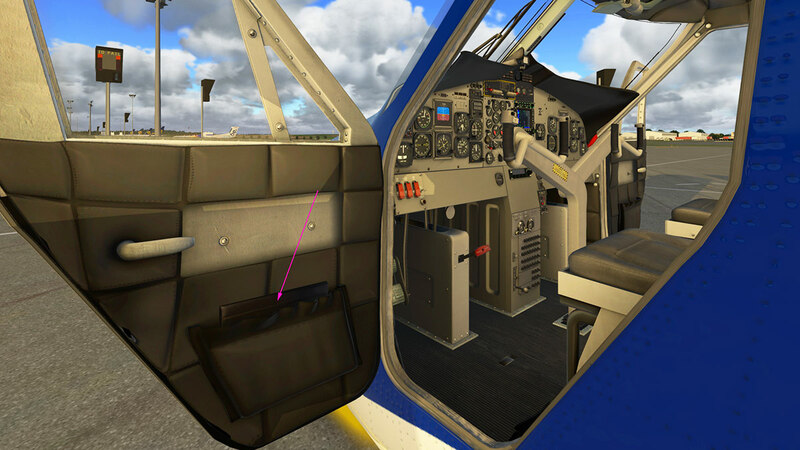 In the original DHC-6 we were a little confused by the Collins AP106 system and as you will notice there is no V/S (Vertical Speed) button or V/S climb or descend knob? 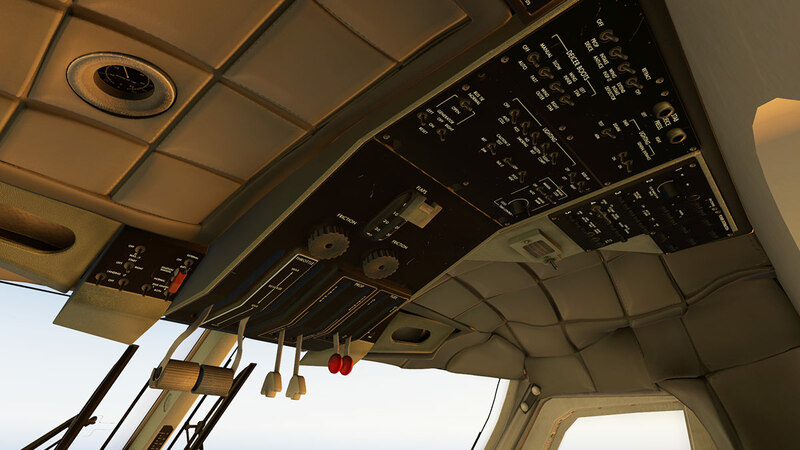 Only an Altitude (ALT) and Heading (HDG) buttons. As the Collins system does not use that type of system to climb or descend. 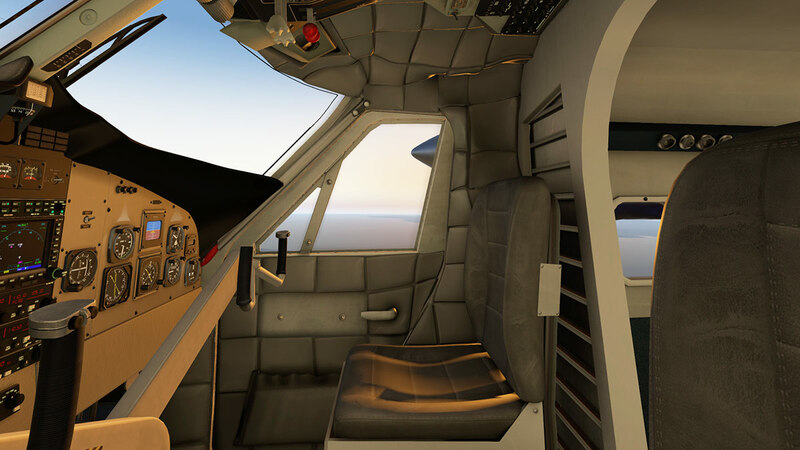 The AP106 is tricky to still use, but as the actual aircraft performance is better, then it works better in here now as well. The trick is to find the right speed in your throttle position and then lock that speed in via the IAS button. 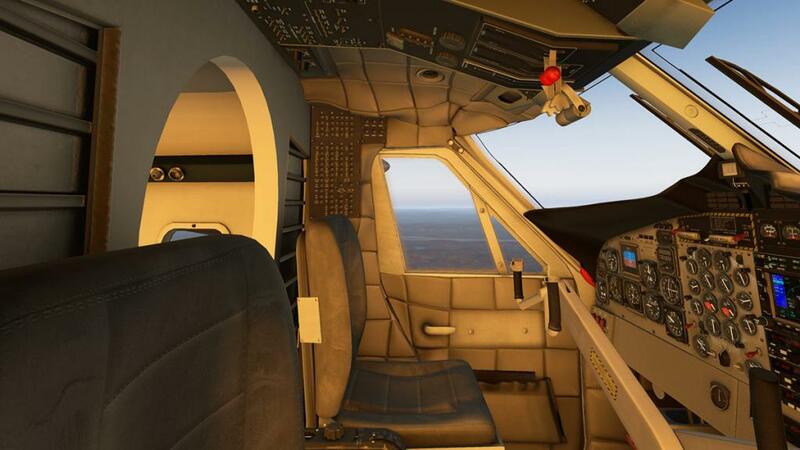 The system works by then adjusting the throttle to climb or descend. 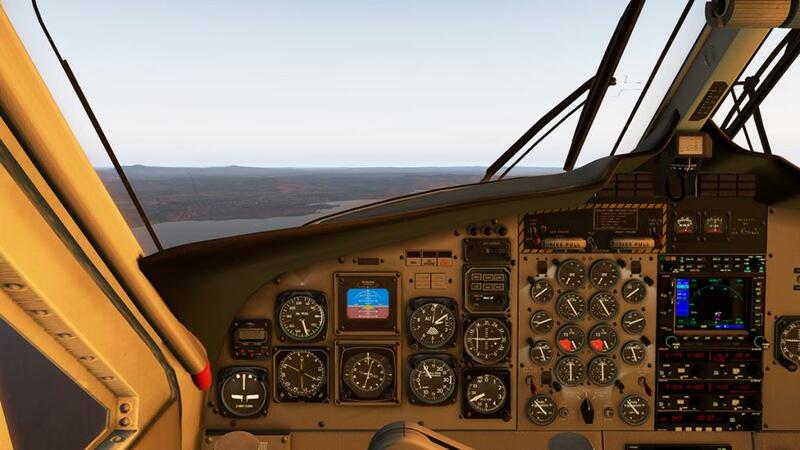 You aim or goal is for a speed of around 105kts to 110knts and a climb rate of around 1000fpm as noted here for the best of both worlds, and the specified climb rate is around 1600fpm. 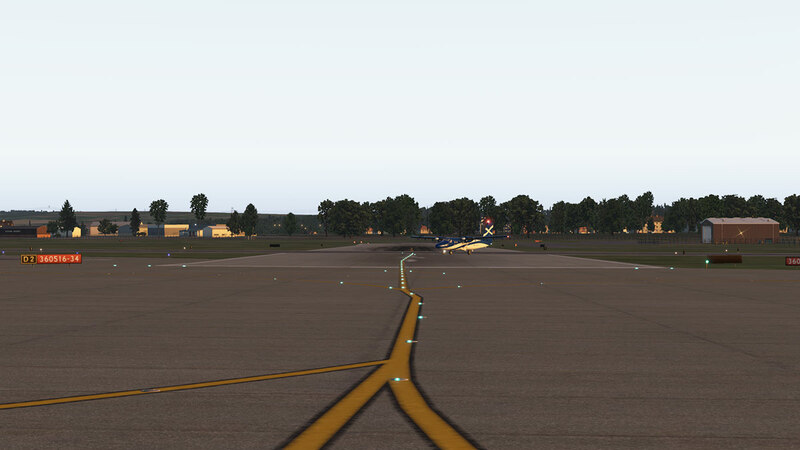 To descend you do the reverse in reducing and locking in the speed around 80knts and descend around the same 1000fpm. 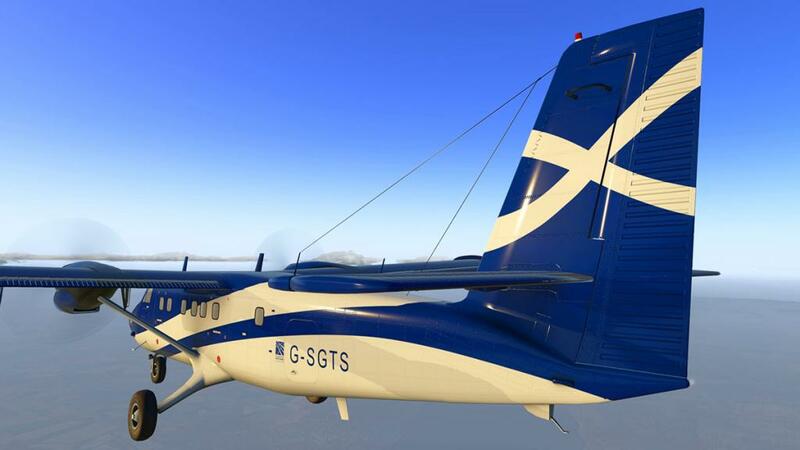 This is a big change over the original version as the aircraft wouldn't descend at all unless you went to extreme measures like even setting the throttle to idle and then even feathering the propellers to go down, which was ludicrous. 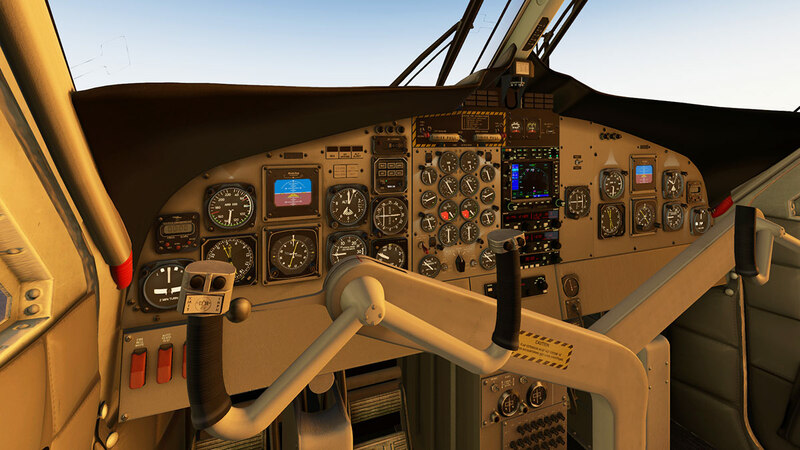 ALT ALERT button is really the altitude hold button for the selected required altitude, and it works in both modes of ALT and IAS disconnect when the set altitude is attained, but it can be tricky to set sometimes. 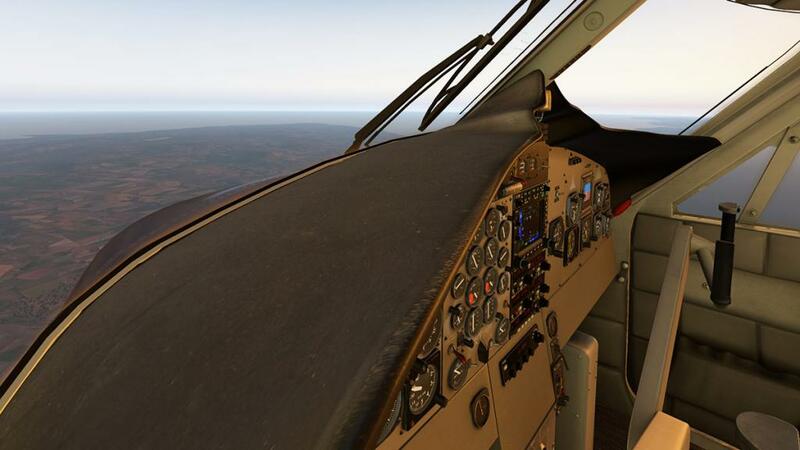 A note on to have the trim correctly set is now important, not only for the initial takeoff but for the AP106 interaction... if the trim is out, then the AP106 will do silly things like climb or descend too quickly. so a set trim and a level aircraft helps in AP106 transition. An item to note is that you have to manually disconnect the AP106 by both the buttons and the switch. If you use a key or in my case a joystick button to disconnect the autopilot then here it doesn't deactivate the AP. 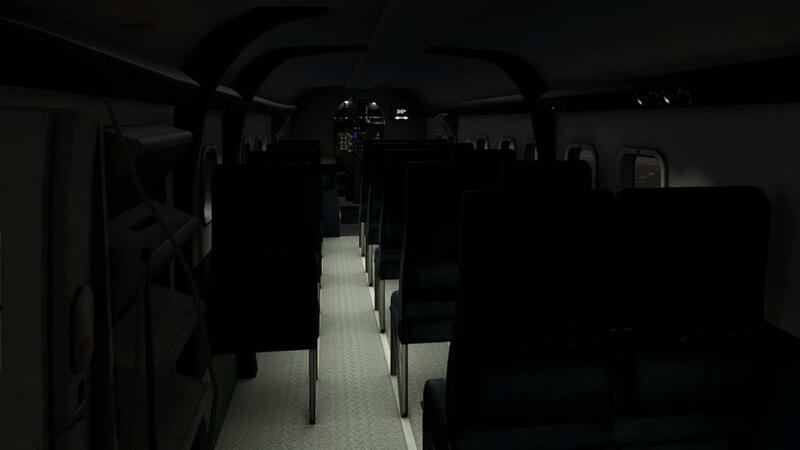 Debatable is the sound package on the aircraft. It is a FMOD setup and has 3d surround sounds and good variation in sound. 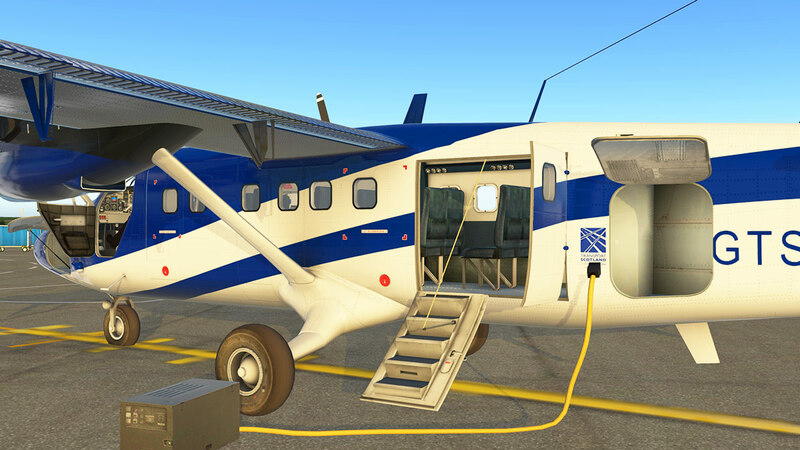 The package uses a professional PT6A soundpack, which is noted as one of the best for the Twin Otter. And in most areas like start up, idle and takeoff power the sound is very good, but the in flight internally sounds are very buzzy, light and don't have much depth or even drone and the sound pitches don't change much with any throttle changes. 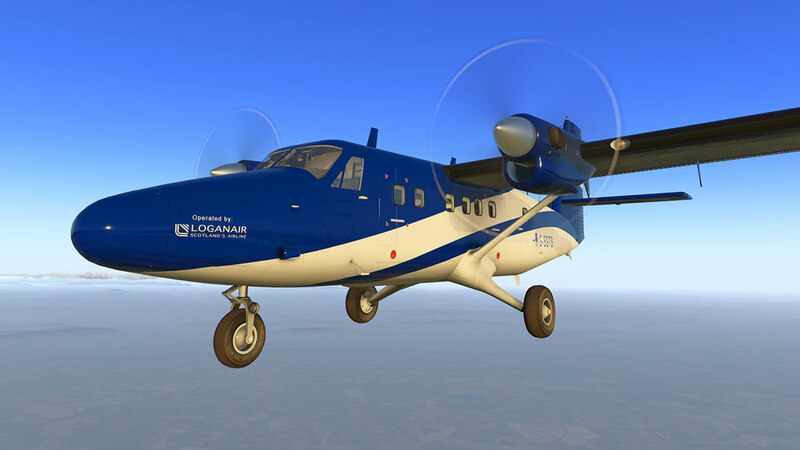 The sounds do come well regarded and so I am going to put the aural question out there as some aircraft like the Twin Otter do have a particular feel and sound, so feedback is welcome, but they did grow on me. 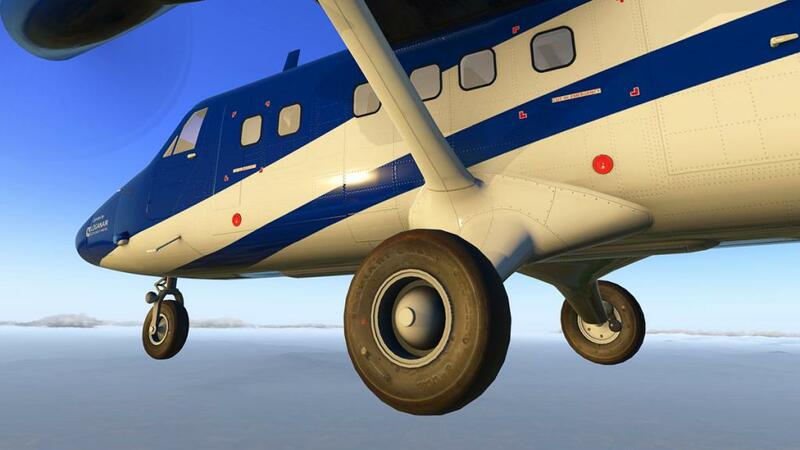 Another point to make is that the RW Design's Twin Otter doesn't like the xEnviro weather plugin very much in the visual stakes, the view from the cockpit is fine, but if you look at the propellers at any time they show the real scenery through the movement. 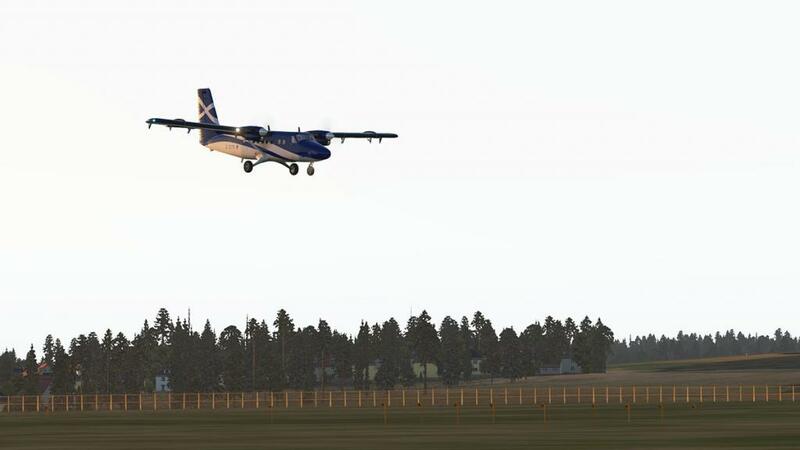 This of course an X-Plane/xEnviro issue and not the developer's issue, but it is currently not the best external view with xEnviro active and the normal X-Plane weather is used here in this review. Although a few of the original elements like instruments have been moved over and updated, in context this is a completely new cockpit and instrument panel. The main panel does feel slightly duller and flat, than the lighter smoother approach on the original, but the quality is far, far higher and detailed. We are used now to excellent metal style instrument panels, but here it is authentic to the flat grey used on the aircraft. 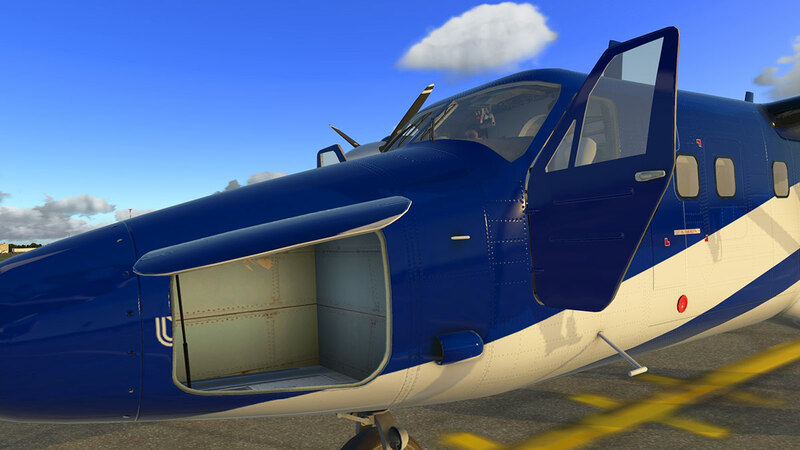 The excellent glareshield is really well modeled and textured, so overall it works very well. The classic dual yoke is well reproduced, but it can't be hidden. 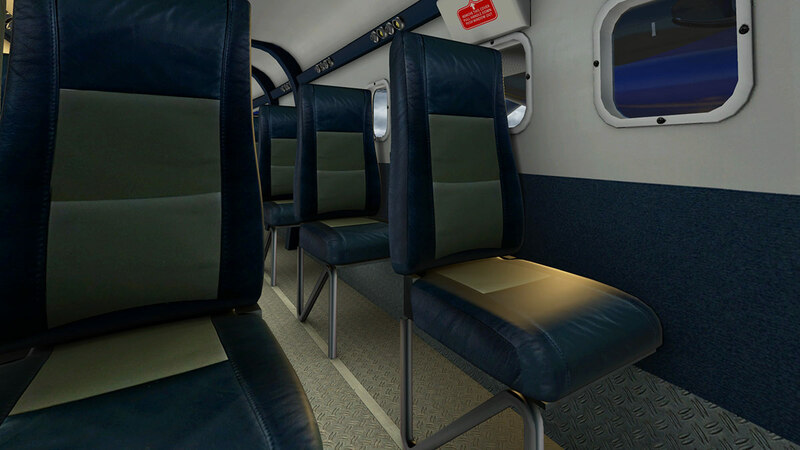 The iconic Twin Otter overhead panel (OHP) is excellent, fully featured and really well produced. The OHP was good before, but this complete redesign is now even more authentic and realistic, but you do have to set a key "quickview" to get a quick upside down view of the rear of the panel if you want to access the switchgear, overall it is all really well done. 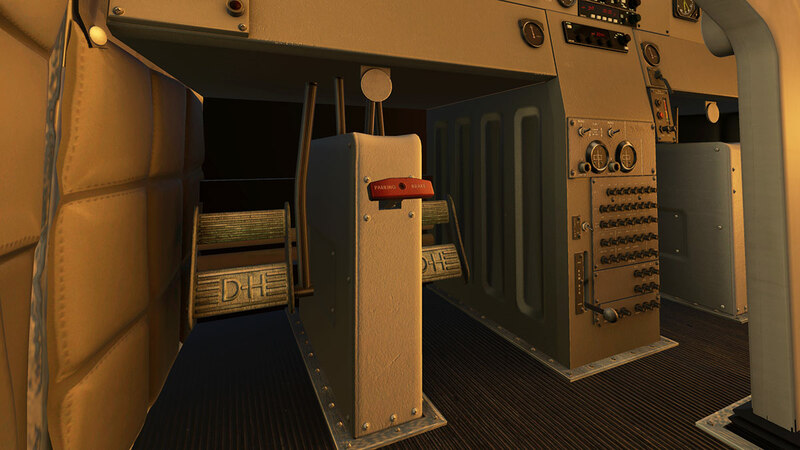 Under the panel and floor is also very well completed and realistic, with lovely crafted DHC rudder pedals, centre upright fuse panel with built in fuel gauges. And note the great Brake Temperature display panel. Cockpit quality and seats are as good as the cabin, and the only noticeable point is the cockpit/cabin divider is not a clean arch. 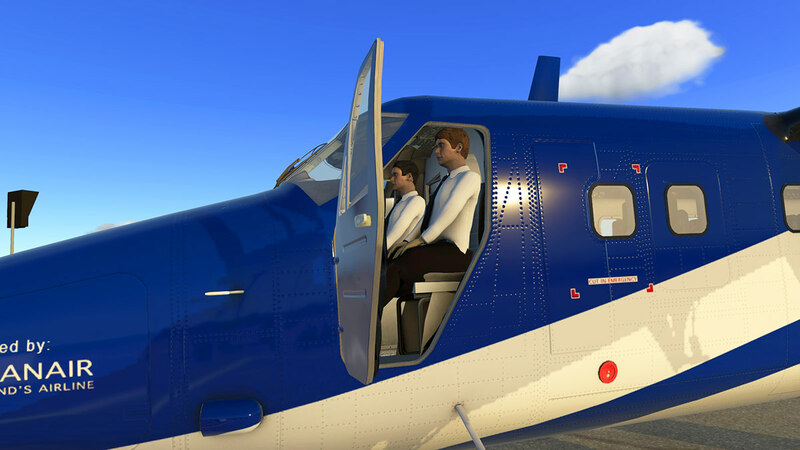 The excellent trim controls on the pilot's right seat arm, are however beautifully created and authentic and very nice to use.. The Instrument panel layout has had a few changes. First up is the completely new BendixKing electronic Artificial Horizon, replacing the flat (awful) design of the original on both sides is a huge improvement there. 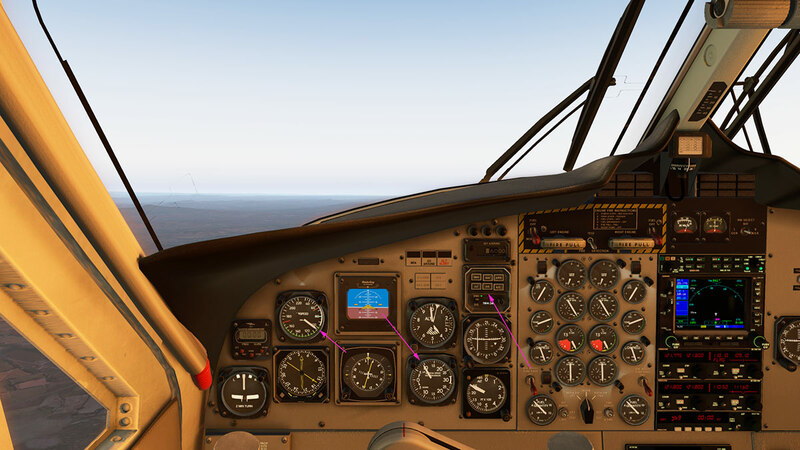 The Collins AP106 system's button panel has been moved from the right-centre instrument panel to the pilot's side for easier use, and there is now both a VOR(2) and ADF dial bottom left (only a single ADF dial before). 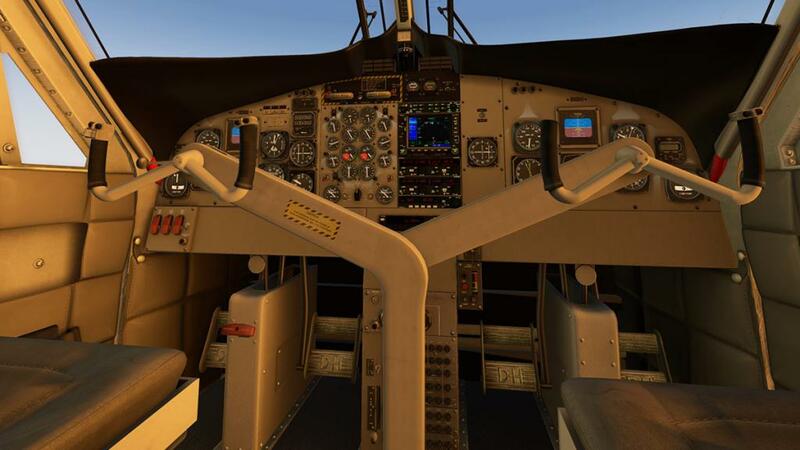 The Course Deviation Indicator (OBS) looks like it was moved, but in fact it is still in the same place, as the Radar altitude has been moved below it to allow the fitting of the AP106 button panel above. 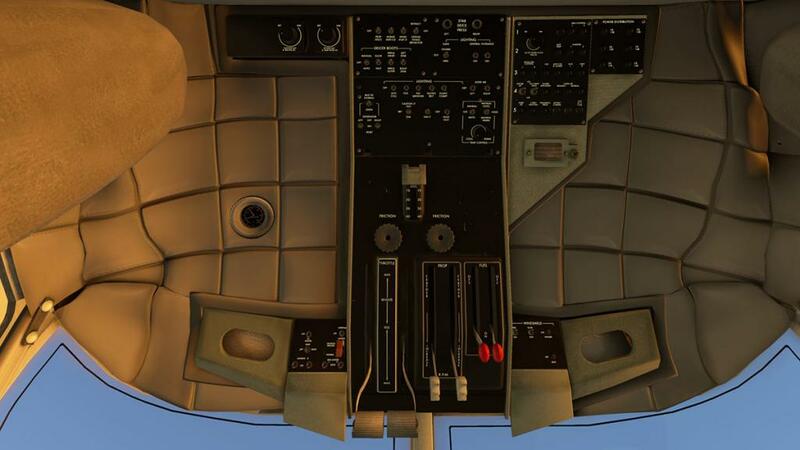 The equipment avionics stack is different as well. The KMA 28 audio panel is top, with the GNS 530 below. The radios are more basic, but also more realistic with two KX 155As for COMM1/VOR1 and COMM2/VOR2 receivers. A KR 87 is your ADF and centre below is a KT 70 BenedixKing Transponder. 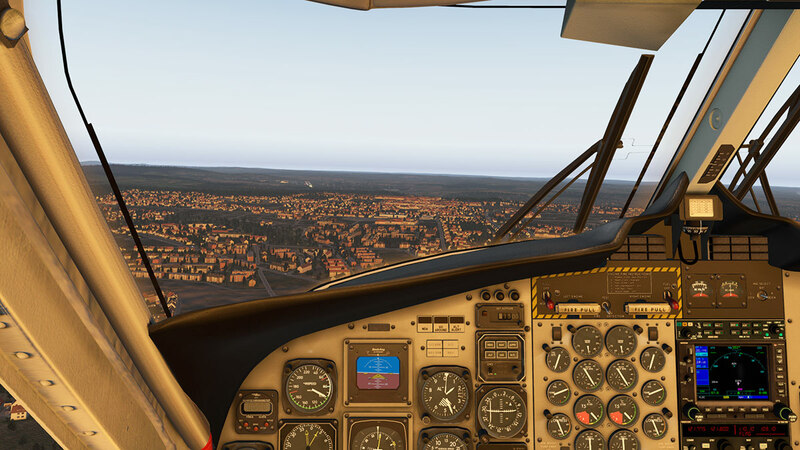 You can if you have purchased the (expensive) RealityXP GTN 750 or GTN 530, use them in the aircraft and replacing the native GNS 530. 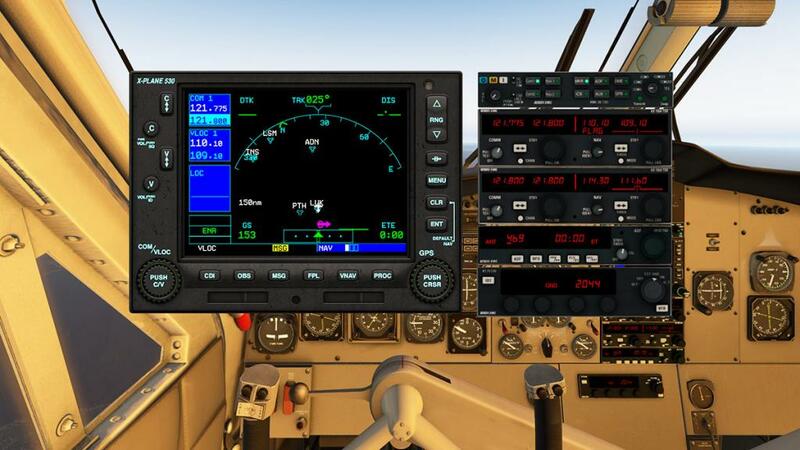 The GNS 530 and the radio panels all pop-out for ease of use. 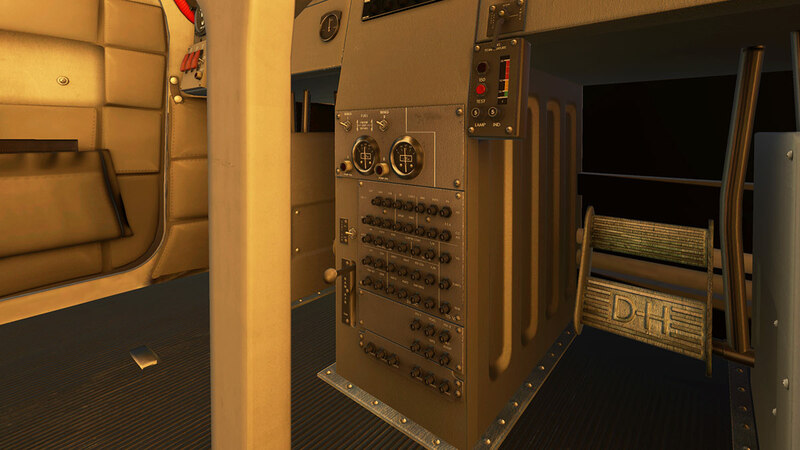 All instrument and radio panels have nice reflections, real, but not overly done. Panel lighting is indirect, but looks great even in the daytime. On the lighting theme, the cockpit is very good, in a black and white way. 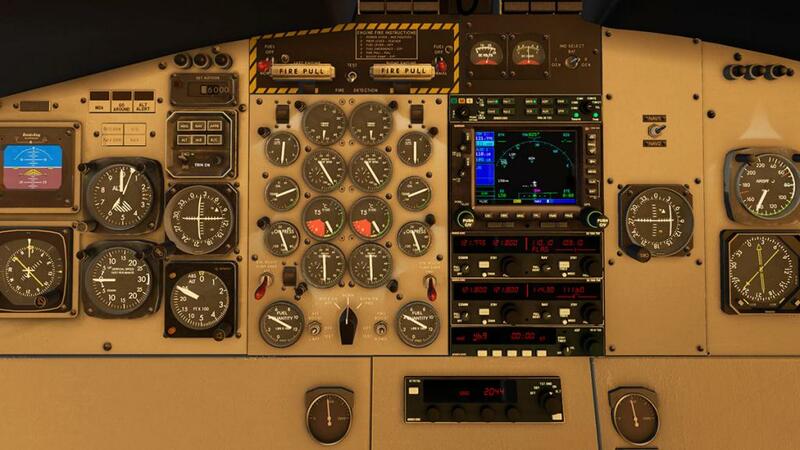 But the dials are very clear and concise for night landings. All instrument lighting is adjustable and the cockpit is lit by only one light above your head. ... The seatbelt and no-smoking sign is nice touch. External lighting is very good, with a single front strut taxi light and two wing mounted landing lights, standard tail-beacon and navigation lights and excellent strobes. 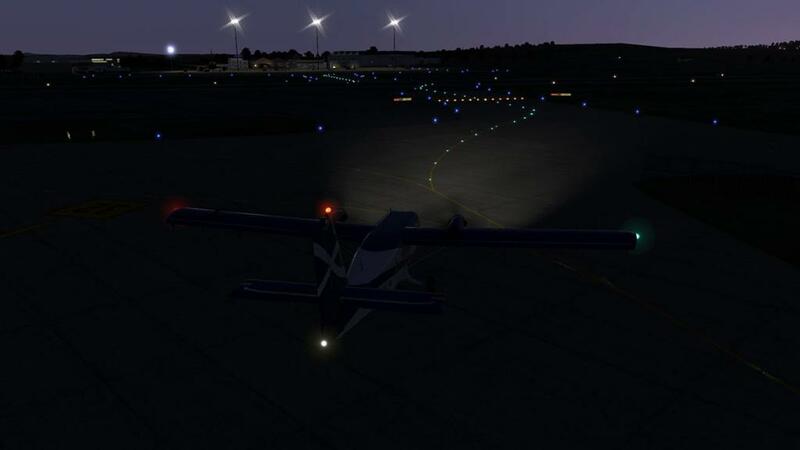 Landing light throw is very good as is the powerful single centre taxi light. Aberdeen is waking up as we arrive at Dyce. After doing the controlled descent, with the IAS set at 80knts and around 1000fpm to 1500ft. You set the approach speed with 20º flap and just in the green zone at 90knts. 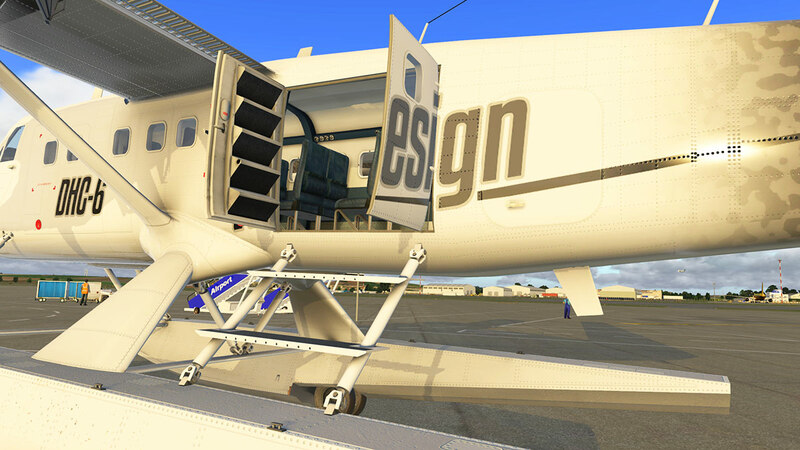 Remember this is a STOL (Short TakeOff and Landing) machine, so those flaps act like barn doors when lowered, but give you super slow control. 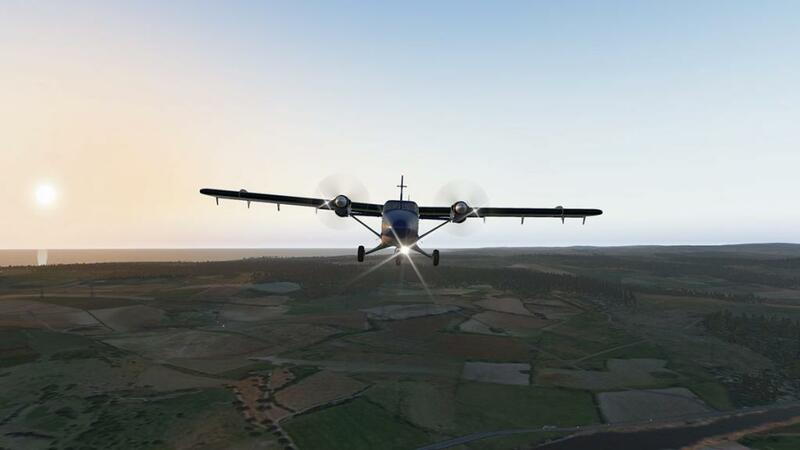 Full flap at 40º will give you a slow speed of around 70knts, but if the sea breeze is strong you have to work the rudders hard to keep the runway alignment as that large DHC tail works for you and against you at the same time. 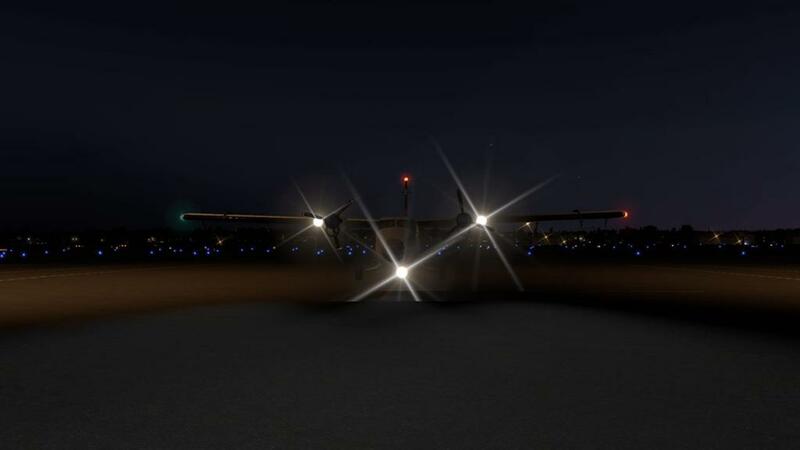 ... it is an aircraft to get into the right groove with, but once there you are really into the aircraft and it comes to you. 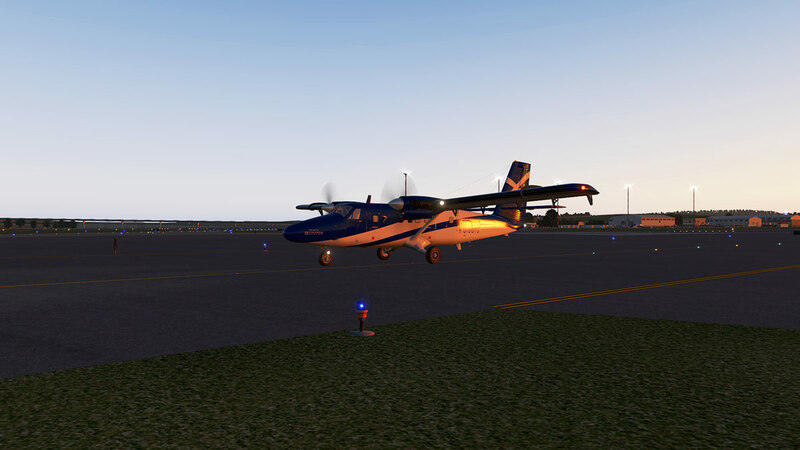 Landing speeds can border on the 60knt stall, but you seem to hold it fine to gently touch down, the speed is so slow you can just roll the speed off more, but if you need it then there is reserve prop thrust by setting the "Full reverse thrust" setting, but I never did. 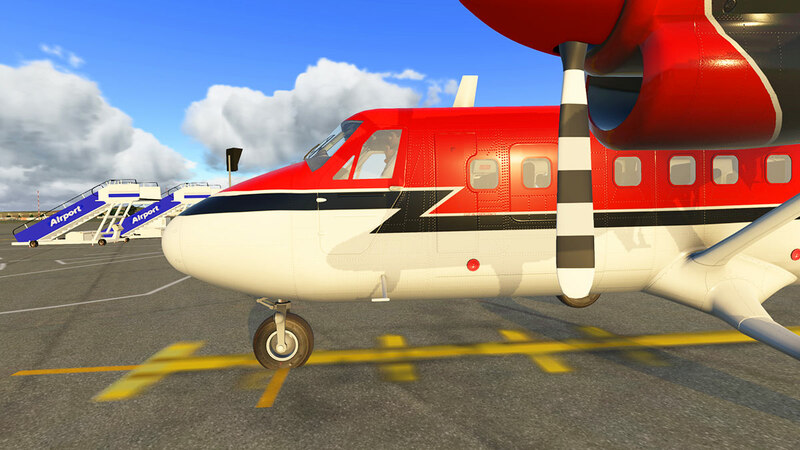 The rest of the liveries are all long nose and every livery works with every variant in Float, Ski and Tundra. All are excellent Hi-Def quality with the lovely Air Seychelles a highlight. 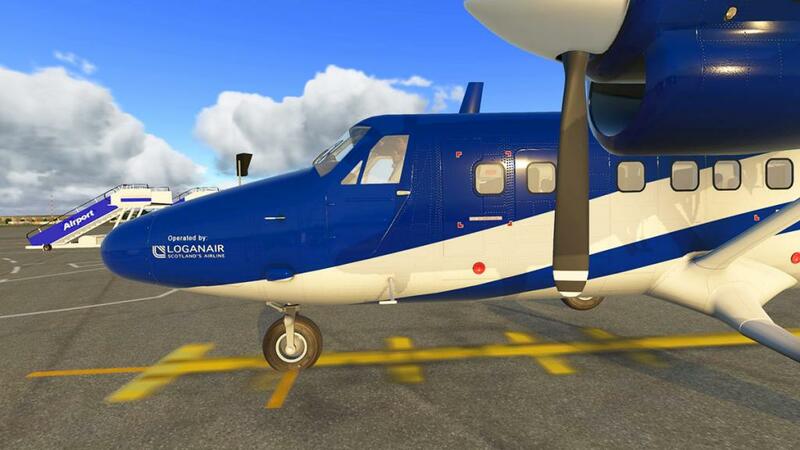 First glance is that the Twin Otter from RW Design's is just an update, but this aircraft is very, very different from that fact. This is a complete rebuild of the aircraft and only a few of the original elements are actually present. 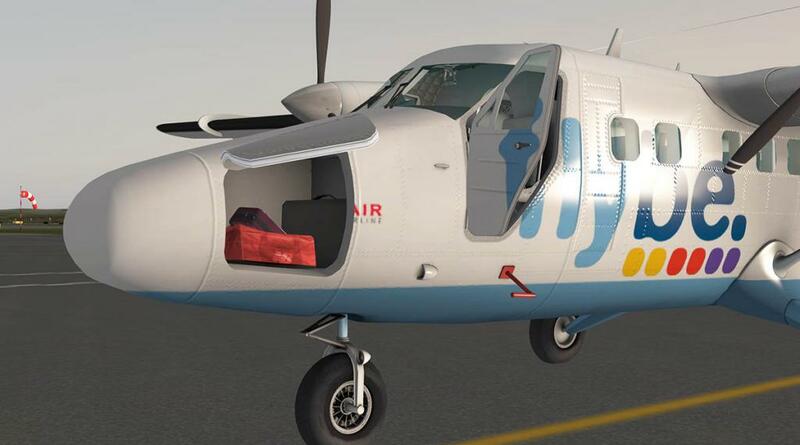 This comprehensive upgrade is really an all new aircraft and with the excellent quality to match the better detailing. 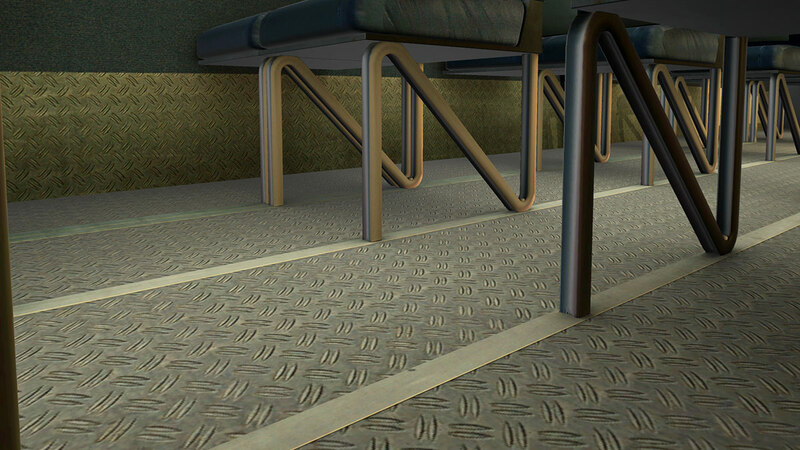 Highlights are many with an excellent cabin with lovely well done textures and realistic metal flooring, and luminescent lighting. 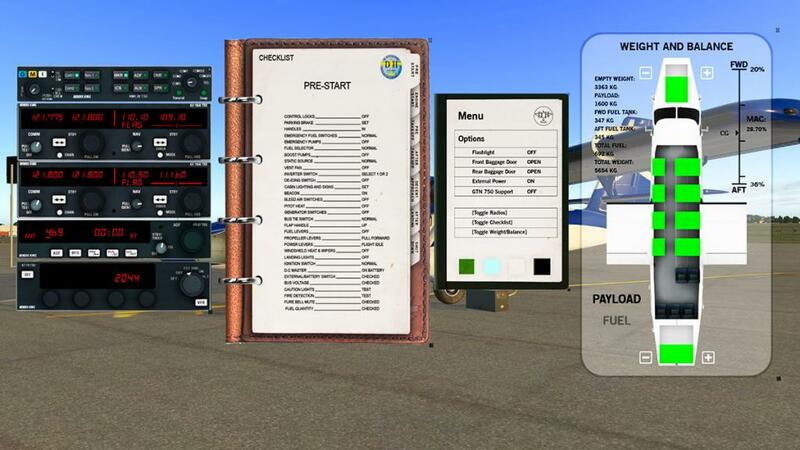 A menu system that can change the cockpit colours and an easy to use Weights&Balance page, Checklists and pop-up radios. The depth of the quality grows with every flight. 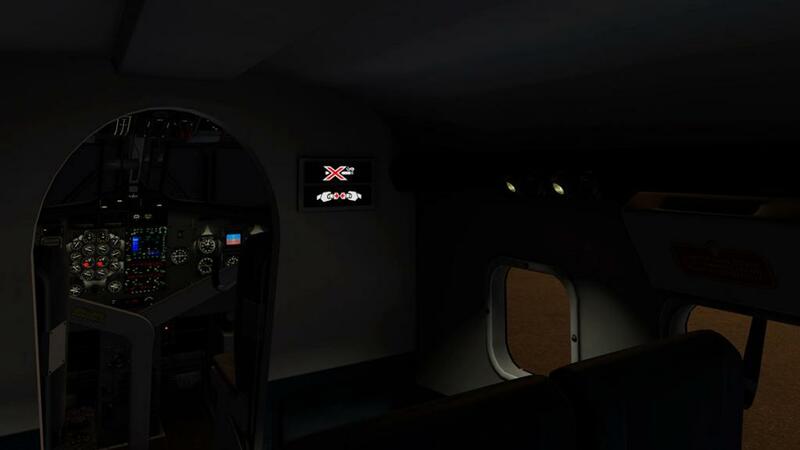 X-Plane11 features have made the aircraft far more dynamic, not only in the way the aircraft uses the PBR, but with the better X-Plane11 performance dynamics, something in performance was missing on the original release aircraft, but fully restored here and the images here in this review don't lie as the aircraft looks brilliant in great lighting. 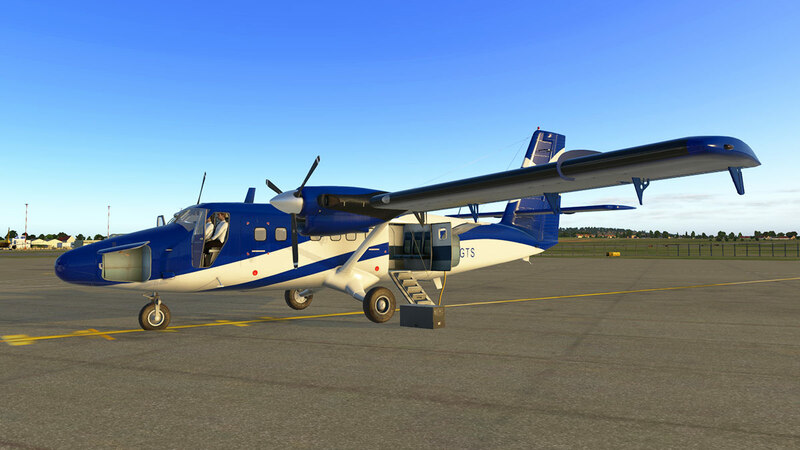 Four variants with the Standard Wheels, Float, Ski's and Tundra tyres is a value four aircraft, with also Short and Long Nose versions available. Overall this is an outstanding upgrade, but I question the sounds, and they are FMOD great, and they do actually grow on you, but can be tiring over long distances. More menu options would be a nice option and certainly for opening all the doors (the rears can be hard to reach), hiding the Yoke, static elements and making the change of the colour scheme to cover the cabin as well as the cockpit. 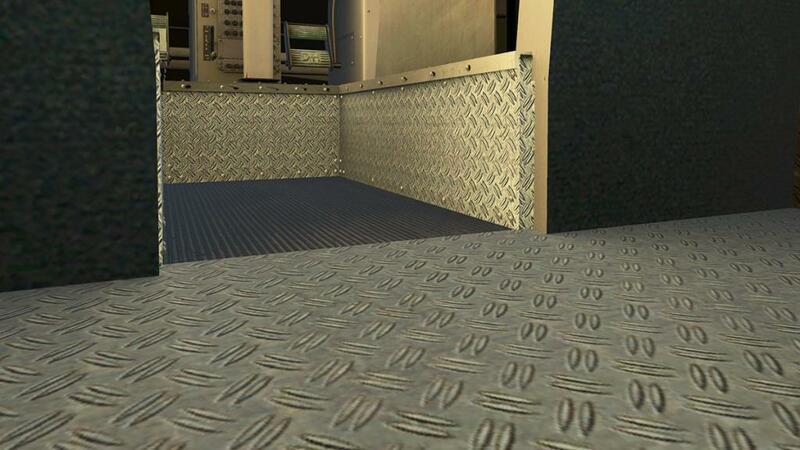 A cargo version with that metal floor would be nice as well. Currently if you own the original version v1 then you can get an upgrade to this excellent v2 for 50% off, which is great deal, so be quick. Overall this is a comprehensive upgrade to a classic aircraft, in reality it is completely different design in every area, but a very good one. It is also a significant upgrade of quality and design from RW Designs, who was good before, but design is now at that much more a higher level... 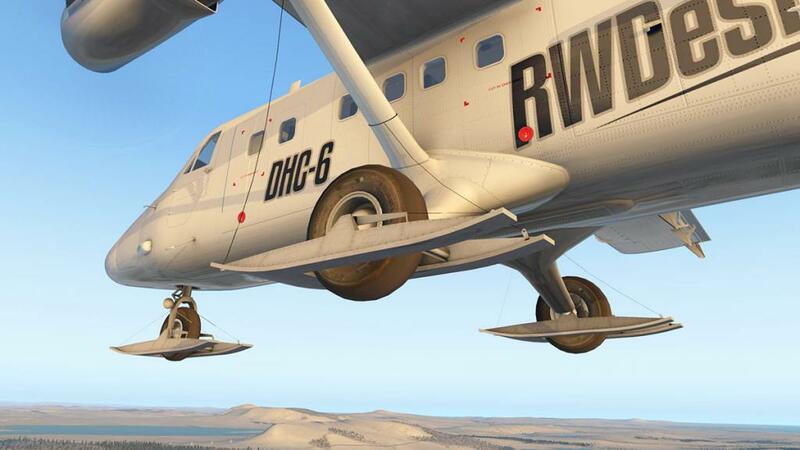 It was a brave thing to do to completely redesign an aircraft in time and dedication, but that has paid off in spades here... and that is in making this DHC-6 Twin Otter -300 v2 an excellent aircraft to own, fly and use. 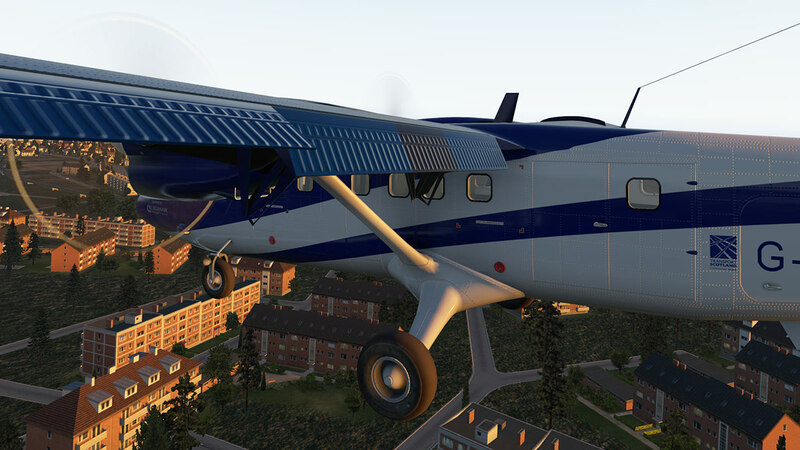 Note - If you have already purchased the DHC-6 Twin Otter v1 you can purchase this new v2 Twin Otter for 50% off. 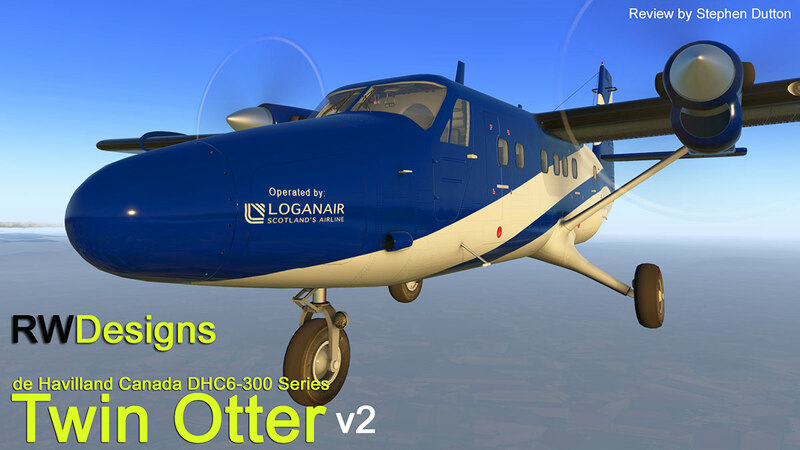 Find your coupon code under your DHC-6 Twin Otter invoice at the store (doesn't apply to Twin Otters from other designers). All of which work with both short and long nose variants! Another excellent review - my plastic is quivering. 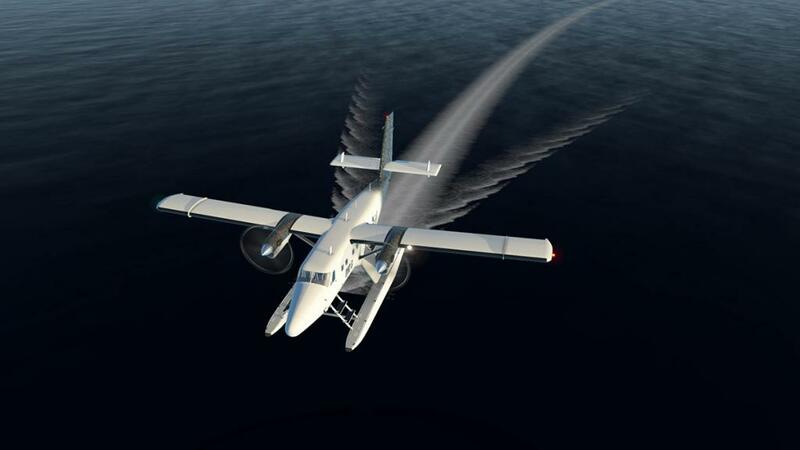 No water rudders 'cause it uses asymmetrical thrust to steer on water. An excellent review, so thorough. Your articles are always a delight to read. 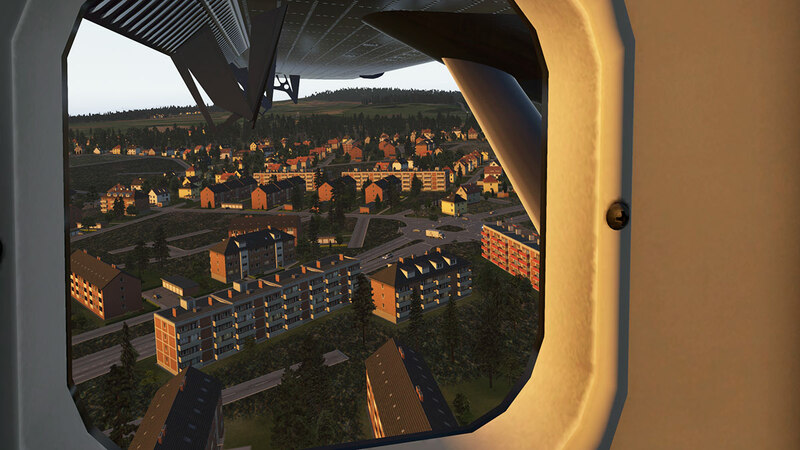 You can hide the yoke with the X-Plane keyboard command. 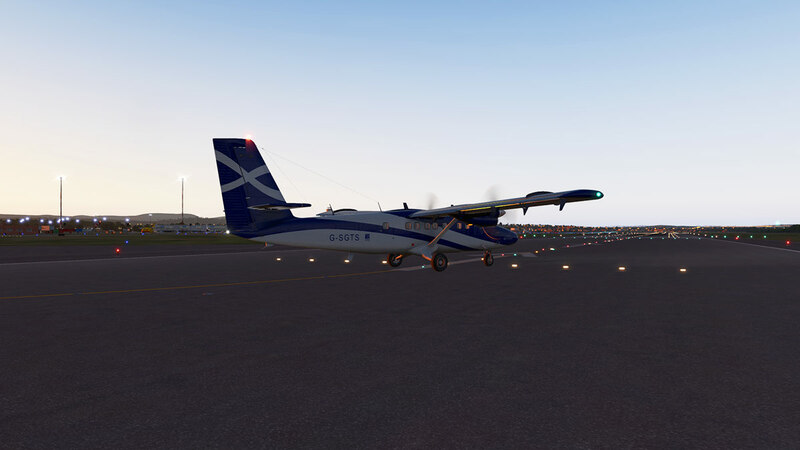 As a result of your reviews, I have started flying from Aberdeen to Shetland! 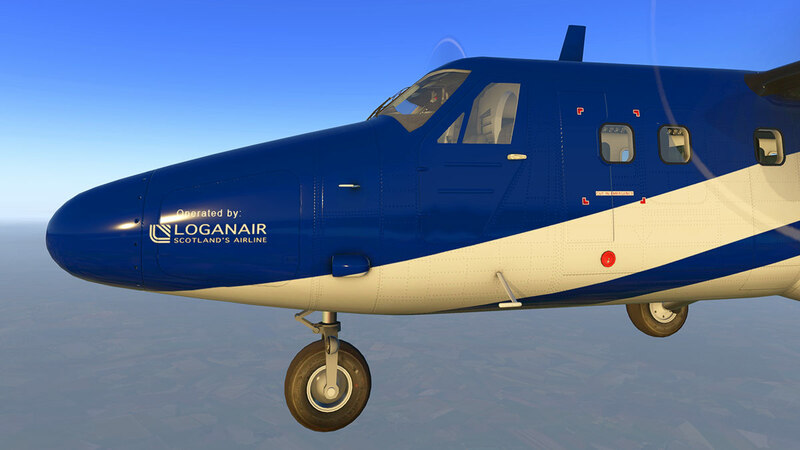 I must say, having just got this, it is an absolutely fantastic airplane model. Good review. I agree with you about the sounds - something funny going on there. They don't seem that good and don't seem to change much. 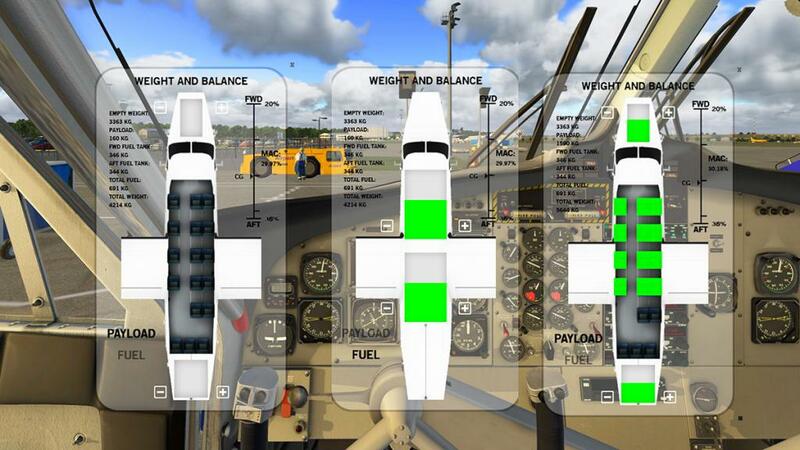 You perhaps overlooked one big thing that I really see as an improvement over V1 - this time you can map the mixture/fuel levers to your hardware (like every other aircraft). In V1 you had to use your mouse, and it was one reason I gave the aircraft away. The GTN-750 interface is a bit of a problem - it basically does not work. I am sure that they will fix it, but so far it is not working for me. 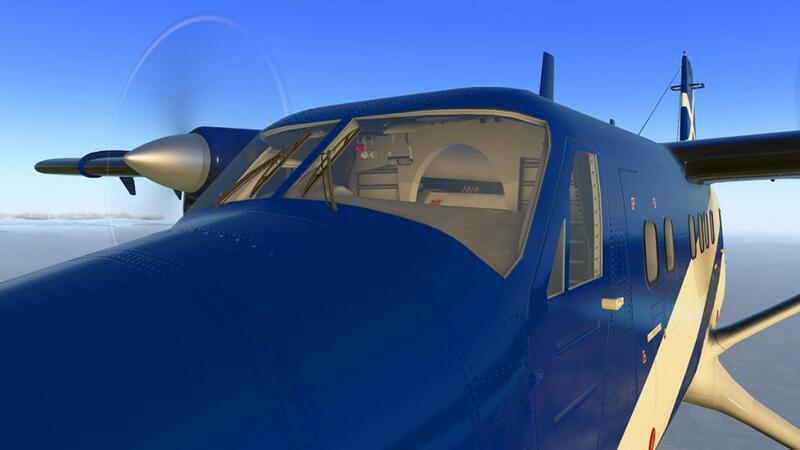 The autopilot is a bit hit and miss also, as you hinted at. This might be as in RL also, so it is not a big complaint. But I found that it did not always capture an altitude when ascending. 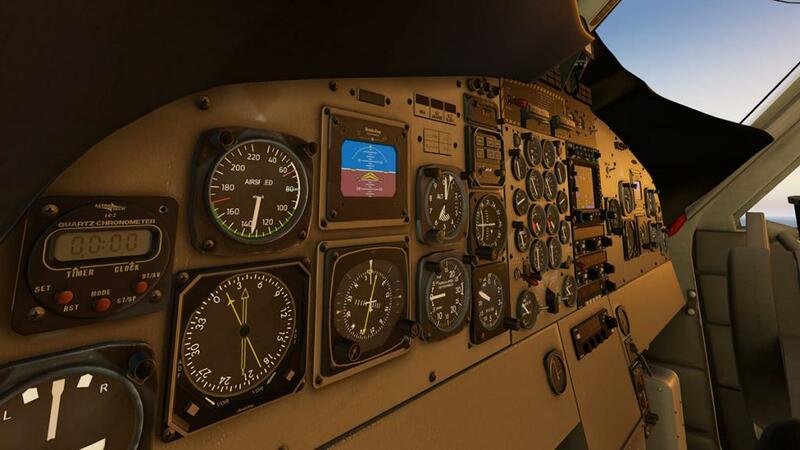 Operating the altitude knob was fairly good though. 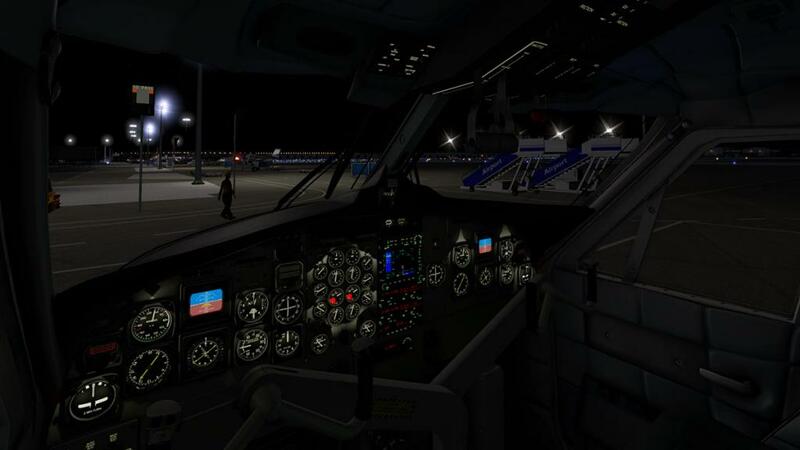 The big thing for me is the night lighting. 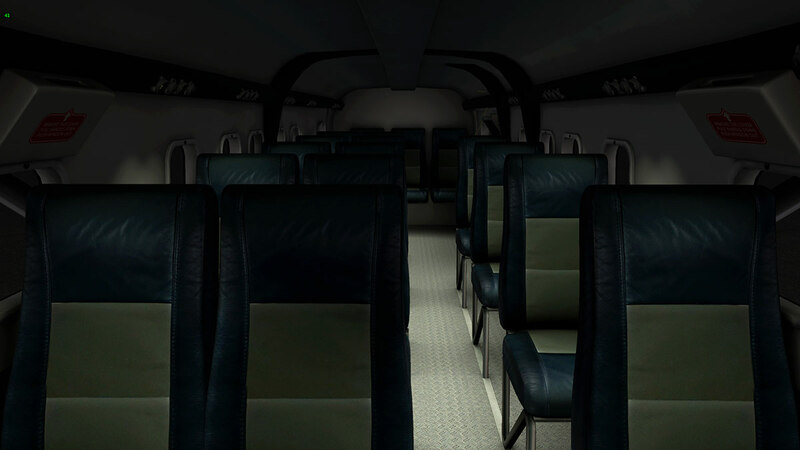 The overhead panel is much like it was in V1 - unreadable at night. You can see the lettering ok, but you cannot see any of the switches or knobs, which for me at least makes it unflyable. All the other lighting is just great. I wonder sometimes if we are just getting too spoiled. 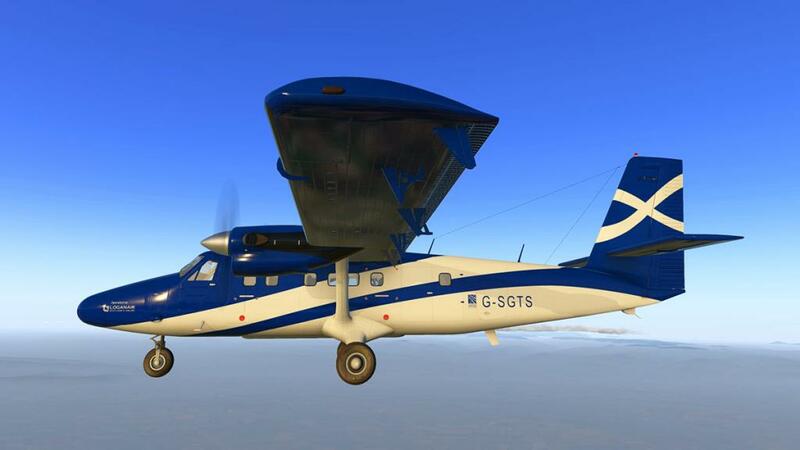 We complain about the smallest of things - when in fact it is a brilliant depiction of a nice aircraft. Hopefully some fixes will come out soon. The Updater issues are already being worked on (it basically does not work). I think the plane would have done well to go to a few beta testers for a week or so before release. Great review Stephen, many thanks! 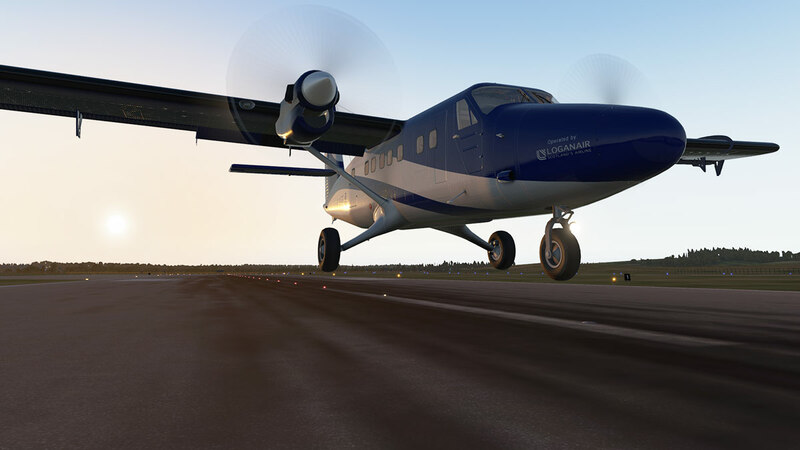 Hmm for a gold standard review check out Almost Aviation on YT - especially with respect to the aircraft systems, I suggest you look here. 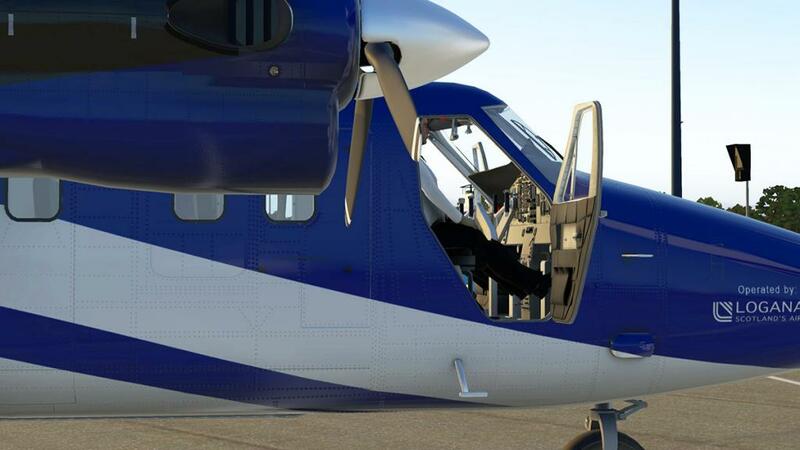 Obviously the guy has a pretty though Twin-Otter set up, so has very intimate details about the aircraft. In most cases the developer will go for a certain version, and will then fine tune the aircraft to a far more detailed version based on details like this provided here. Be interesting to see any update. unless somebody realizes that this needs to be re-done. Quickly. which according to pilots flying this type in real life is a key experience in the twin otter. but it needs things redone please. and i can tell you: base-to-final approaches are aggressively banky and steepy due to the special terrian this plane operates. 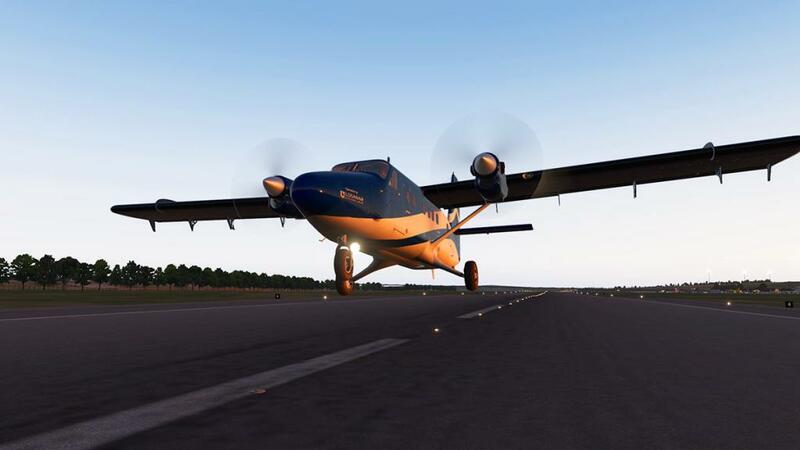 Short approaches are this plane's thing. 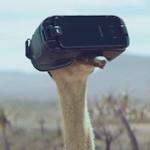 But this virtual product does not include any of these parameters, it is not slowing down when it should, and it does not speed up when it should. 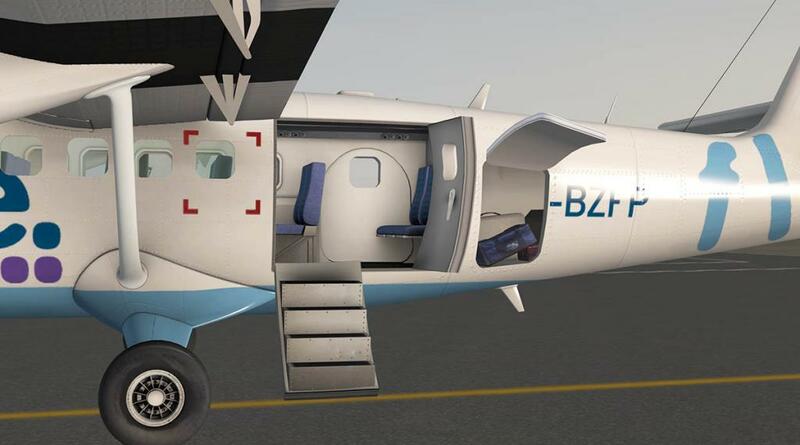 Reverse thrust is hardly noticeable, but it should create tremendous prop noise and shake the frame and get a fast rest. despite that weird ingame-update program, nothing has happened since release. 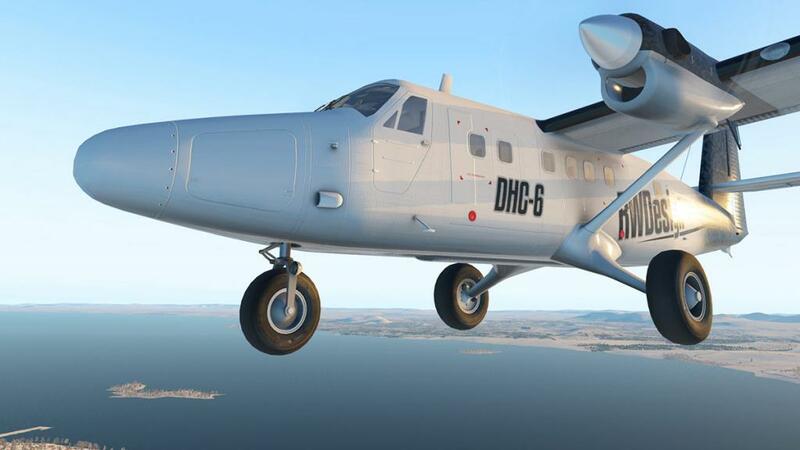 Releasing benchmark planes like the DHC6 means special responsibility and dedication. No one else is gonna do it after this one has been hitting the market, so there is no competition unfortunately.